Council has received the attached letter from the Department of Local Government which is in response to Council’s progress report on implementing the recommendations of the Promoting Better Practice Review Report. The Department has assessed Council’s progress based on its letter of 24 March 2009 and also auditing of Council’s business papers. In general it is pleased with the progress but has identified 3 specific issues which require attention. These matters are a review of Council’s policy on payment of expenses and the provision of facilities to Councillors; the establishment of an internal audit function and thirdly continued attention to the upgrading of the Works Depot to overcome pollution risks. The policy on payment of expenses and the provision of facilities to Councillors has been reviewed with reference to the Department’s guidelines and also Sydney City Council’s policy which itself has been the subject of recent review. The Department is requesting Council establish an internal audit function. A recommendation is made for the establishment of an internal audit function. The Department notes Council’s endeavours to initiate action to overcome potential pollution risks at the Works Depot and urges that Council continue with its upgrade program. There are options in relation to the recommended amendments to the policy on Payment of Expenses and Provision of Facilities to Councillors and also in relation to the establishment of an internal audit function. It should be noted that the Department of Local Government has described the establishment of an internal audit function as, “an essential component of a good governance framework for councils”, and do not accept that the size of a Council is a reason for not having internal audit. Acting contrary to a “direction” from the Department is not recommended. The Department specifically requests that Council review the policy that was adopted on 18 December 2008 to ensure it is consistent with these guidelines, particularly in relation to information on the payment of legal expenses. The existing policy with proposed changes is circularised (doc 15866/2009). The major substantive changes relate to the introduction of carer’s expenses, capped at $500 per annum, and a clear definition of claimable legal expenses. The recommended changes are based on the Department’s “Guidelines” for the payment of expenses and provision of facilities for Mayors and Councillors and also a review of Sydney City Councils recently adopted policy. The provision for carer’s expenses is modelled on Sydney City Councils with their annual limit of $2,000 being revised down to a recommended $500. The provision for legal expenses mirrors the Department’s Circular 05/08 except that Council should specifically avoid expenses for any action in defamation. 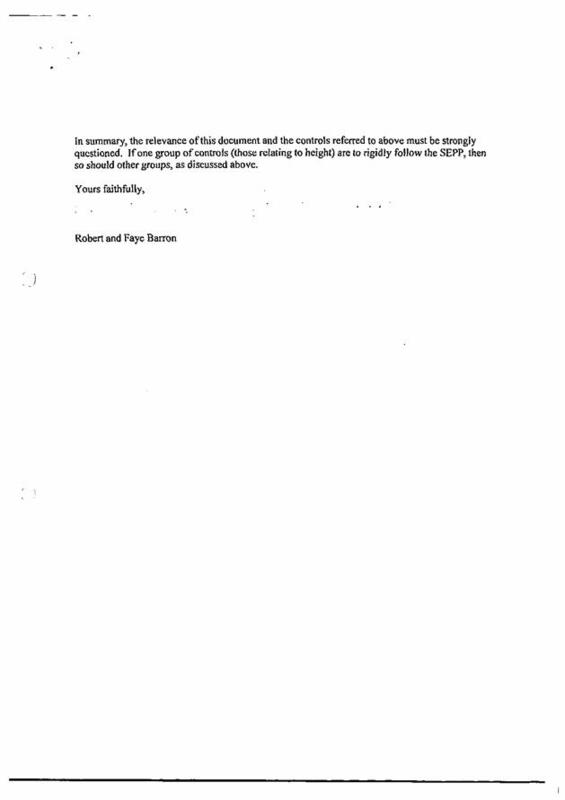 The Department’s Circular 05/08 leaves open the prospect of “reasonable legal expenses” being paid to a Councillor defending an action in defamation, “provided the statements complained of were made in good faith in the course of exercising a function under the Act”. The caveats attached by the Department together with the potential for litigation are such that Council should steer clear of any involvement in funding defamation expenses. The Department has referred Council to recommendation no. 11 of the PBP Review Report. Recommendation no. 11 provides that Council should consider the establishment of an internal audit function that might comprise a shared internal auditor and/or an Internal Audit Committee. In Council’s progress report on implementing the PBP Review Report, the Department was advised that enquiries had been made with other Mid North Coast Councils regarding the possibility of sharing an internal auditor and/or audit committee. There was no interest from adjoining Councils and with a likely cost of $20,000 per year plus staff support, the Department was advised that at this stage, it is considered to be beyond the resources of Council. However the Senior Investigations Officer of the Department has subsequently impressed upon myself the importance of an internal audit capacity and have nominated it as an, “essential component of a good governance framework for councils”. She provided examples of a number of smaller Councils with internal audit systems in place, including Carrathool Shire Council. I have also recently discussed the matter with Council’s auditor. 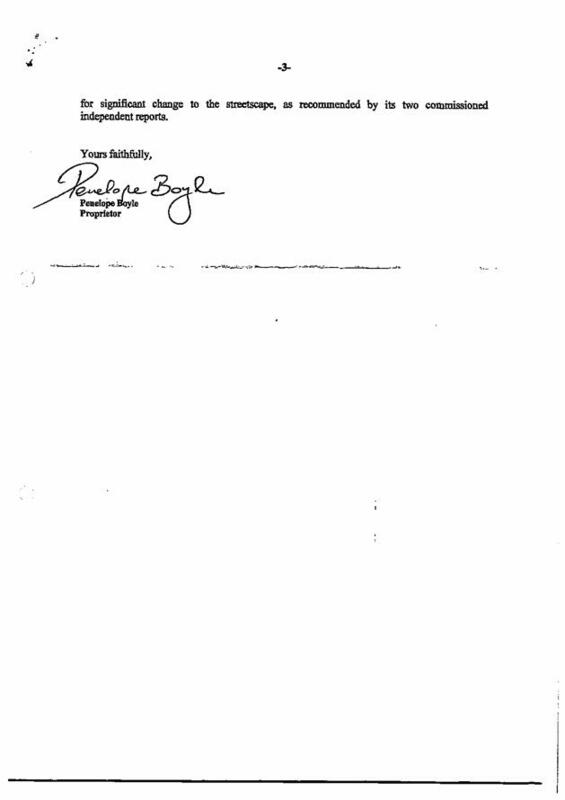 The Department of Local Government issued internal audit guidelines in October 2008. These guidelines are 53 pages long and can be found on the Department’s website but the essence is summarised in the following paragraphs. Internal audit is described as “an independent, objective assurance and consulting activity designed to add value and improve an organisation’s operations. It helps an organisation accomplish its objectives by bringing a systematic disciplined approach to evaluate and improve the effectiveness of risk management, control and governance processes”. Generally, the internal audit function is led by the General Manager who is the most senior member of staff in the organisation responsible for the internal audit function. The Internal Auditor should report functionally to the audit committee and administratively to the General Manager. It is recognised that smaller councils may not be able to justify a full time internal auditor and there are alternative resourcing models that may achieve the required outcomes on a cost effective basis. The alternative approaches are the appointment of a full time or part time internal auditor; outsourcing to possibly a private sector accounting firm; and regional or inter-council sharing of internal audit resources. The realistic options for Council are either a part time internal auditor; an outsourcing arrangement or an inter-council sharing. As there is no interest to date from adjoining Councils, a part time or outsourcing arrangement are the available alternatives. The outsourcing of the function of internal auditor is preferred at this stage because of its flexibility; access to a wide range of expertise; and ability to switch to an inter-council sharing arrangement should the opportunity ever arise. The Department suggest that for a smaller Council the Internal Audit Committee comprise 1 Councillor eg Mayor or Deputy Mayor and 2 independents. At least one of the independents is to have financial expertise and the other can be from a nearby Council. There would also be 2 staff members with observer status, eg the General Manager and Chief Financial Officer. The audit committee should also have its own charter that sets out the roles and responsibilities of the audit committee and its oversight of the internal and external audit functions, including any statutory duties. The elected Council should approve the audit committee charter. The audit committee should meet at least 4 times per year. 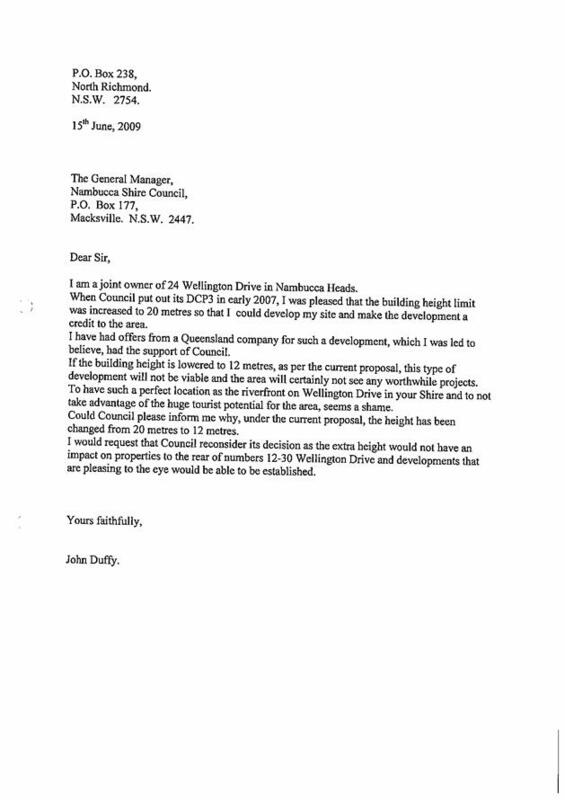 Even with a “minimalist” model for an internal audit function comprising an outsourced internal auditor and utilising an adjoining Council to provide an independent member to the Committee, and with 4 meetings per year, it is estimated that the cost to Council will be in the vicinity of $20,000 per annum. Given the specific request from the Department, it is recommended that Council proceed with the establishment of an internal audit function and review its effectiveness after 2 years of operations. Recommendation no. 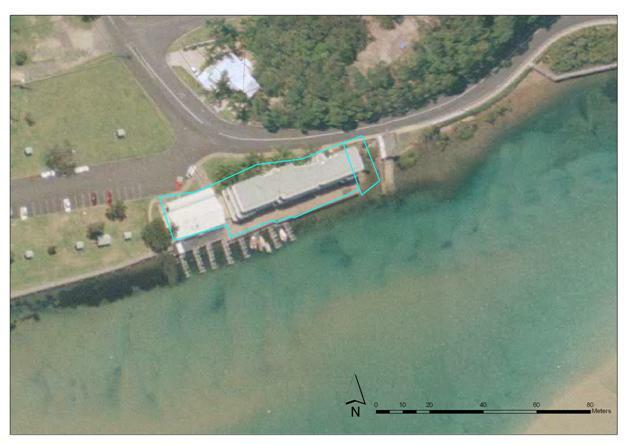 35 of the PBP Review Report provided that Council should address deficiencies identified in the Environmental Management Systems study of the Council depot at Macksville to initiate action to overcome potential pollution risks from the site. The Department acknowledges that Council is making strong progress in relation to this recommendation and urges Council to continue with the work. There is $263,000 in the budget for 2009/10 for the upgrading of the vehicle wash down bay. Following a successful trial of off site diesel purchases, the existing diesel fuel tank on the site is also to be decommissioned. The forward financial plan also makes provision for on-going work to address environmental and OH&S issues on the site with an average expenditure of $215,000 in years 2010/11 to 2013/14. 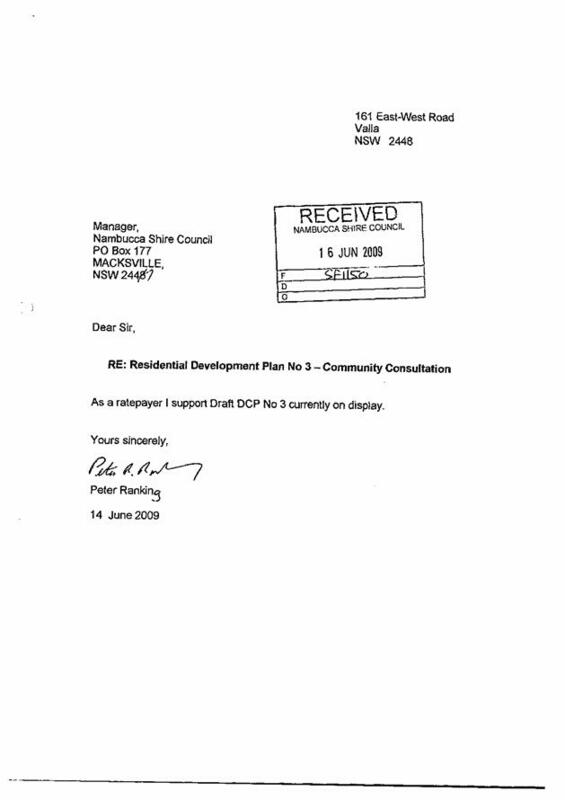 Council is required to provide a further progress report on outstanding recommendations no later than 30 April 2010. There has been consultation with the Senior Investigations Officer of the Department of Local Government; and Council’s Human Resources Manager. The upgrade of the Works Depot will reduce the risk of pollution. The provision of an internal audit function is considered by the Department of Local Government to be one of the most important initiatives to manage risk in Councils. The impact on the budget will be dependent upon the operating arrangements for the Committee and in particular the number of meetings in a year. At this stage, without having obtained expressions of interest from potential contractors and an independent Committee representative, it is impossible to determine an accurate budget. However it is estimated that it will be in the vicinity of $20,000 per annum. At this stage there is no impact on working funds, but the source of finance will need to be identified when Council considers the expressions of interest. 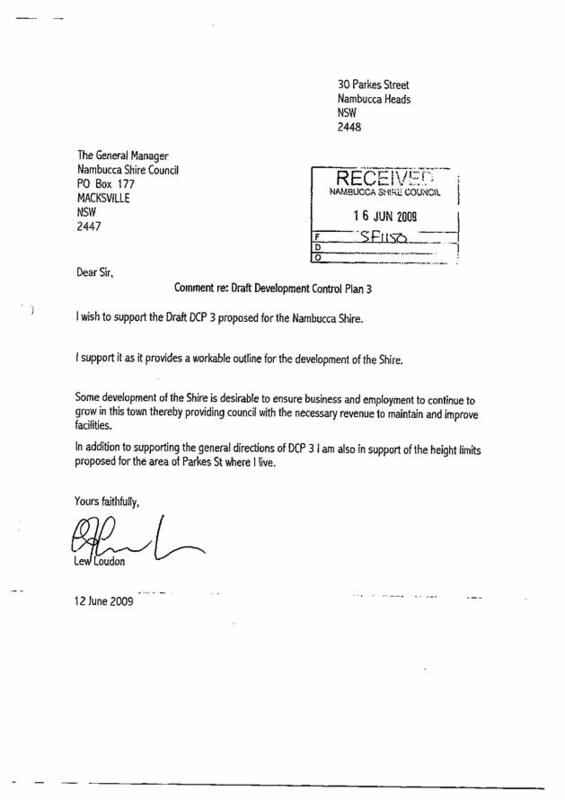 Nambucca Shire Council is scheduled to receive $164,000 as its share of $100m in a new round of community infrastructure funding announced by the Prime Minister on 25 June 2009. Guidelines for the new Community Infrastructure Program funding will be released later in 2009. Considering these criteria and the available funding, the preferred project is improving the drainage of E J Biffin Playing Fields. 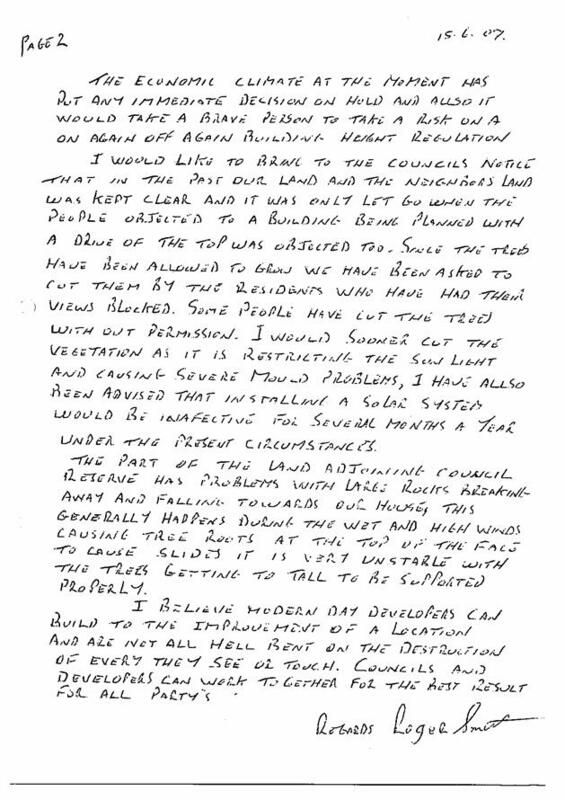 Drainage problems at the Fields have been the subject of regular correspondence from the Committee of Management as indicated in the attached correspondence. A number of other options for the expenditure of the grant funds have been considered. The purchase of the North Macksville Playing Fields from the Roads and Traffic Authority is needed to ensure its assets are controlled by Council and to provide for its on-going development. However the grant program is concerned with creating jobs so it is unlikely that land purchase would be an allowable project. The construction of an amenities building at Anderson Park in Valla Beach is another long standing and unfunded project. However the funding available will not be sufficient and in any case it is creating a new asset compared to improving the condition of an existing asset. Another option for expenditure is the refurbishment of one or more existing public toilet blocks. It will be recalled that public toilets were given a high importance/low satisfaction rating in the 2007 community survey. However additional work needs to be undertaken on assessing the condition of the toilets; costing their refurbishment and evaluating service levels. For example, in Macksville there are 3 public toilet blocks within several hundred metres. This work is unlikely to be completed this calendar year. On 25 June 2009, the Prime Minister, the Hon. Kevin Rudd MP announced additional funding of $220 million for the Community Infrastructure Program would be made available in 2009-10. This funding will assist councils to build and modernise community facilities, including town halls, libraries, community centres, sports grounds and environmental infrastructure. The funding is intended to support local jobs during the global economic recession and provide long-term benefits to communities by renewing and upgrading local infrastructure. · $120m is being allocated for larger strategic projects on a competitive basis. The Government has announced that the funds will flow following the completion of the current round of funding on 30 September 2009. No doubt this is to provide a major incentive to Councils to complete and acquit their current projects under the existing program, which for this Council means completing new change rooms and amenities at Coronation Park. Nambucca Shire Council is scheduled to receive $164,000 as its share of the $100m. Guidelines for both components of the new Community Infrastructure Program funding will be released later in 2009. At this stage and subject to the final funding guidelines being made available, Council should consider priorities for the expenditure of the funds so that the project/s are ready to proceed when the funding is finalised. It will be recalled that the expenditure of the previous round had to be undertaken very quickly and the same urgency is likely to attach to the next round. The previous funding round excluded applying the grant to operational costs; transport infrastructure such as roads, or related infrastructure covered by the Roads to Recovery or Black Spot programs. Considering these criteria and the available funding, the preferred project is improving the drainage of E J Biffin Playing Fields. 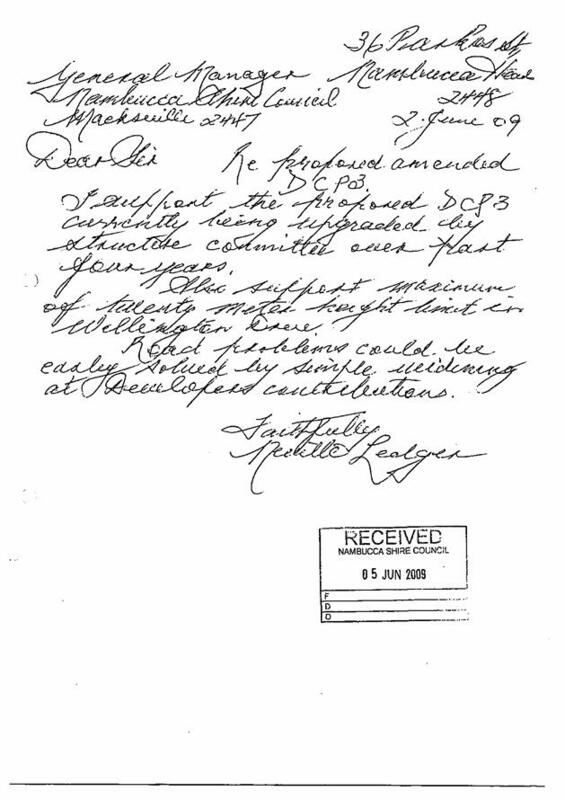 Drainage problems at the Fields have been the subject of regular correspondence from the Committee of Management as indicated in the attached correspondence. In 2008, a plan for a staged upgrading of the Fields was prepared with drainage being the first stage work. Subsequent stages of upgrading are earthworks (stage 2) and irrigation and turf (stage 3). The priority for drainage works is agreed by the President of the E J Biffin Playing Fields Committee of Management. 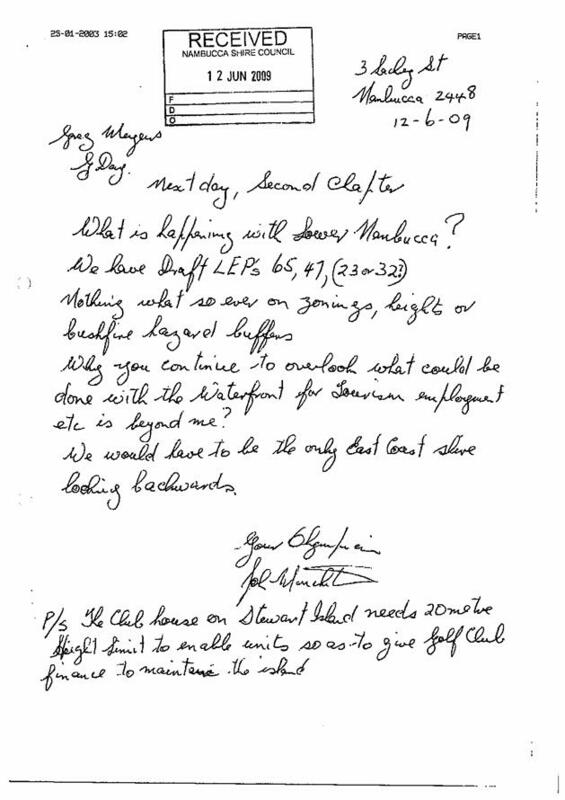 There has been consultation with the President of the E J Biffin Playing Fields Committee of Management. The provision of good quality sporting facilities is important to the social development of the area’s youth. At this stage there are no significant risk implications. At this stage there is no budgetary impact. When the funding offer is formally submitted to Council it will need to be provided for in the budget by a variation at a quarterly review. Similarly the expenditure of the grant funds will also need to be provided for. 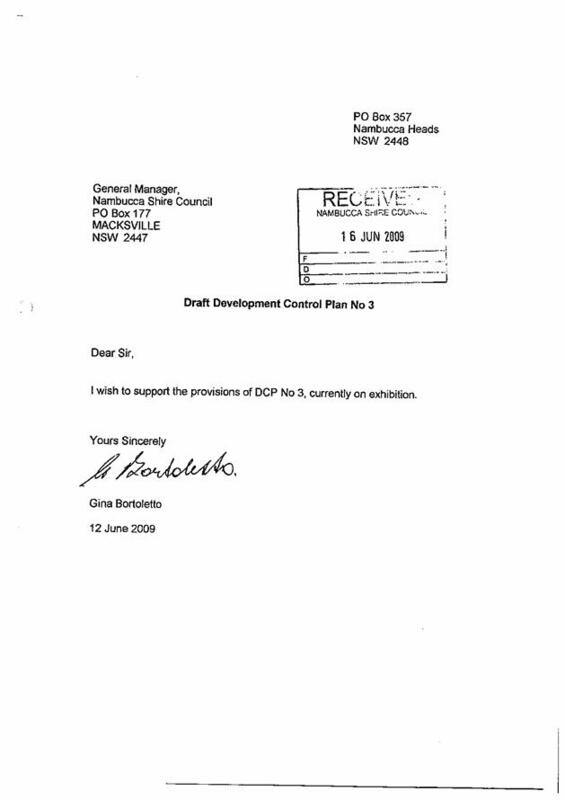 Draft DCP 3 - Residential Development was placed on public exhibition from 22 May 2009 to 22 June 2009. As a result, 38 submissions have been received. The purpose of this report is to inform Council on the result of the public exhibition, and make appropriate recommendations regarding any amendments and subsequent adoption of the draft DCP. 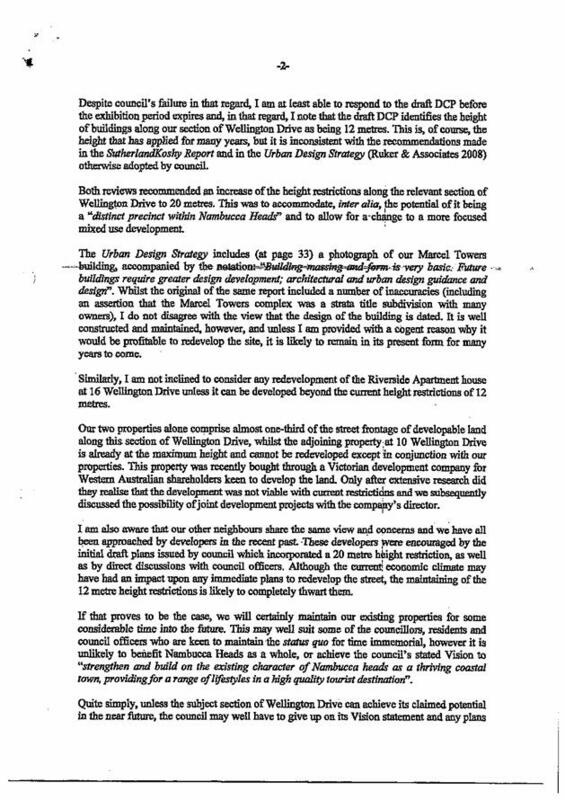 2 That the maximum height limit for 1 Wellington Drive (Strata Plan 32233 and Lot 467 DP 755550) be increased from 8m to 10m. 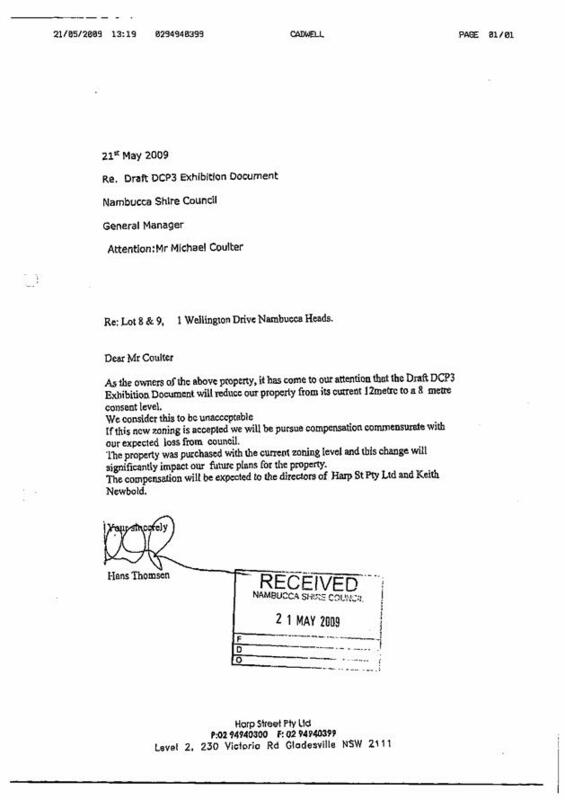 1 Council could further consider recommendation 2 (above) to determine whether the maximum height limit for 1 Wellington Drive (Strata Plan 32233 and Lot 467 DP 755550) should be retained at 12m under the current DCP, or retain the 8m as proposed in the draft DCP, or apply a 10m height limit, consistent with height of the existing flat building. 2 Council has a number of other options, including not proceeding with the draft DCP or resolving to make further amendments to the draft plan prior to adoption. 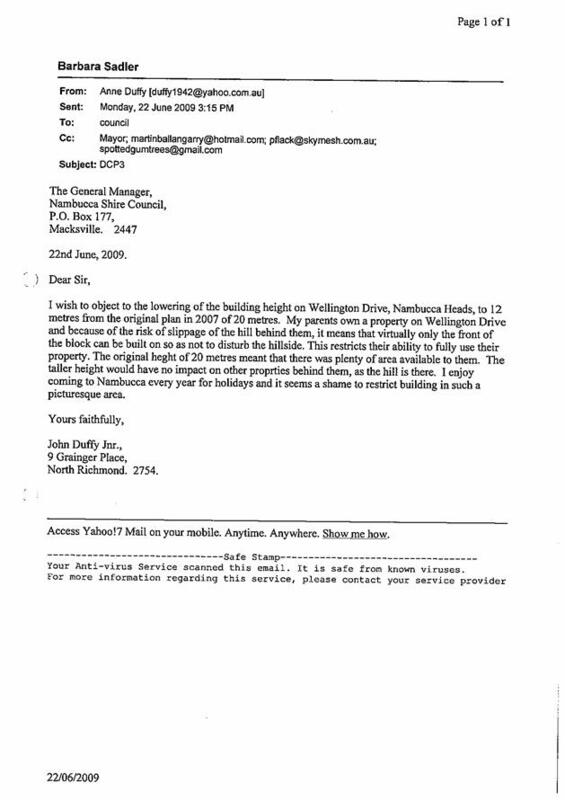 · 14 submissions supported a 20m height limit in Wellington Drive. · 2 submissions recommended the controls should reflect the (SEPP Exempt and Complying Codes). The following specific issues were raised during the submission period. 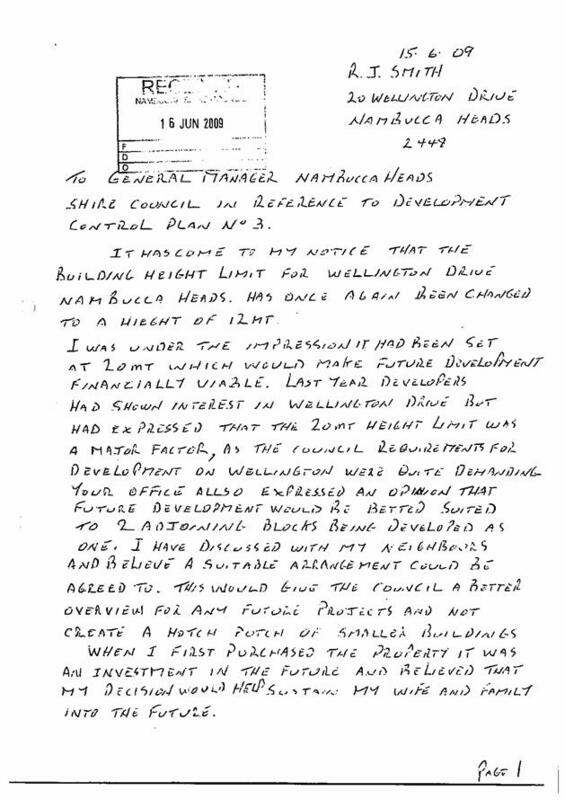 1 Why has the 20m height limit in Wellington Drive been reduced to 12m? As identified above 14 submissions have raised concerns that a 20m height limit in Wellington Drive has been reduced to 12m. 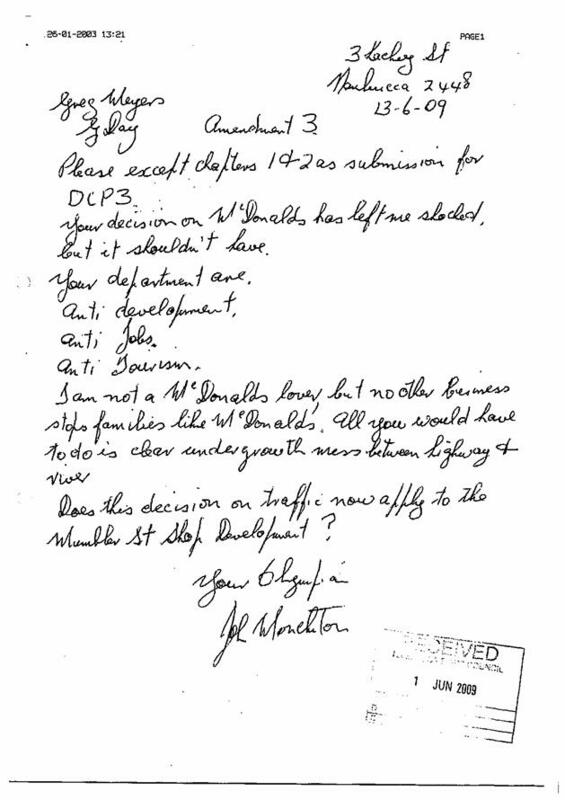 One submission indicated Wellington Drive should retain the existing height limit. 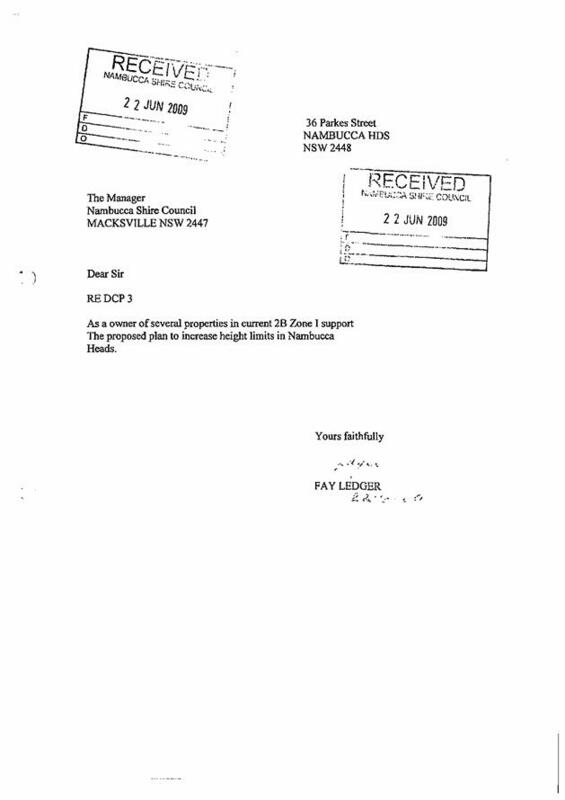 There appears to be some misunderstanding regarding Council’s position with respect to the proposed 20m height limit which was recommended in the DCP 3 Review undertaken by SutherlandKoshy in conjunction with the Nambucca Shire Structure Plan. 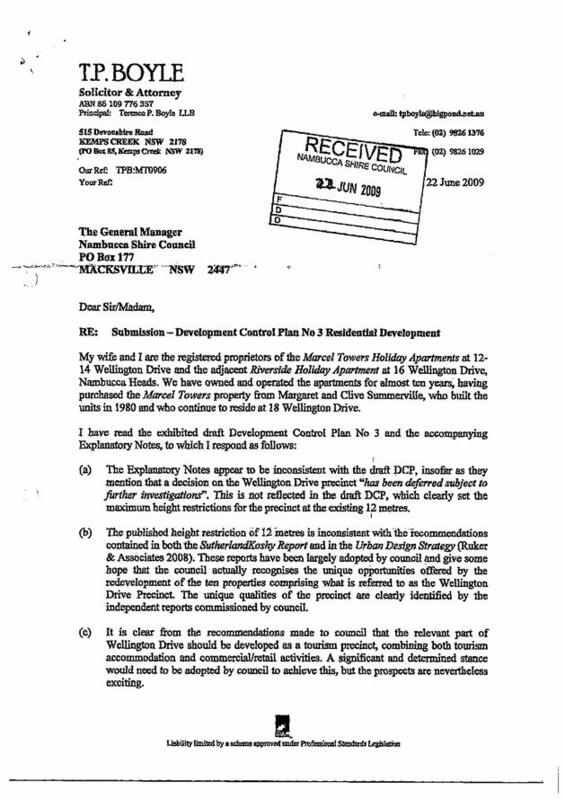 When considering the recommendations from SutherlandKoshy, Council resolved to engage a consultant to undertake several site specific Place Based Studies, including Wellington Drive, to establish Urban Design Strategies. The Strategy was required to consider whether it is able to satisfactorily accommodate the proposed increased height limit from the current 12m maximum to 20m maximum height for the Wellington Drive precinct. The Strategy identified that further studies were required before the 20m height limit was adopted. 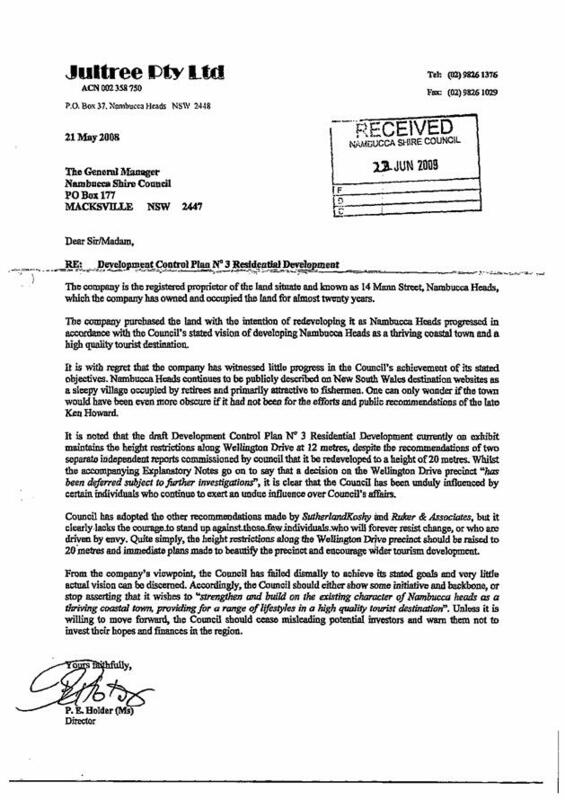 Following the preparation and exhibition of the Urban Design Strategy prepared by Ruker and Associates, Council resolved to defer the determination and adoption of the 20m maximum height for the Wellington Drive precinct due to geotechnical concerns, traffic management issues and potential impacts associated with climate change such as sea level rise and storm surge. 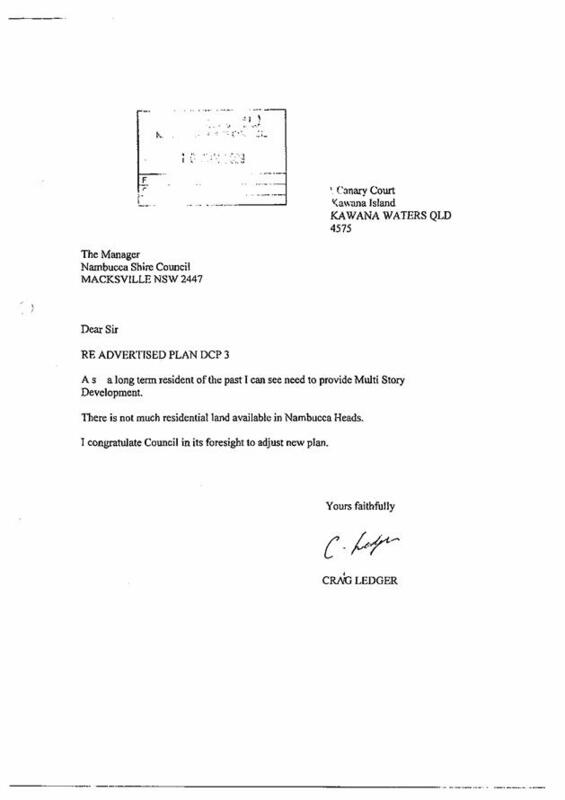 In addition to the Urban Design Strategy, Council engaged consultants to prepare the Nambucca River Foreshore Master Plan. This draft plan will be considering a number of Urban Design issues for the Wellington Drive precinct and once this document is finalised Council may then be in a position to progress towards finalising the heights for this precinct. In the interim it is recommended to retain the status quo of 12m maximum height limit. 2 Height limit variations other than Wellington Drive. Fifteen (15) submissions supported the draft DCP and several of these specifically referred to support for variations to height limits. · Do not increase the height limits at 62-90 Mann Street, which share boundaries with houses in Seaview Estate. The variations to the height limits in Nambucca is an issue which has been considered at length by Council and Council’s Reference Group. Other than specific matters referred to elsewhere in this report, further changes to heights are not recommended at this stage. 3 Golf Club clubhouse requires 20m high townhouses to finance maintenance over the island. Stuarts Island is zoned public recreation and is not intended for residential development. Development of residential units would require a rezoning which would need to consider the flood risks and any consideration of building heights should be part of the detailed rezoning process. 4 Height limits Lot 8 & 9 1 Wellington Drive (Yarning Tree ) SP 32233 have been reduced from 12m to 8m which is not appropriate. Should this reduction be accepted compensation will be pursued. 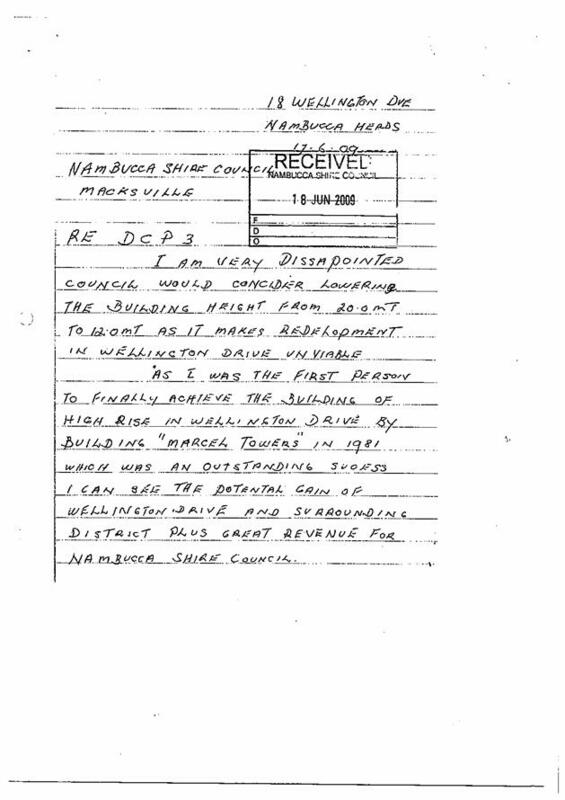 The site in question is shown below. The SutherlandKoshy DCP Review designated this site with a height limit of 8m. This height limit has been carried through to the new draft DCP which represents a reduction of the existing height (12m) limit by 4m. 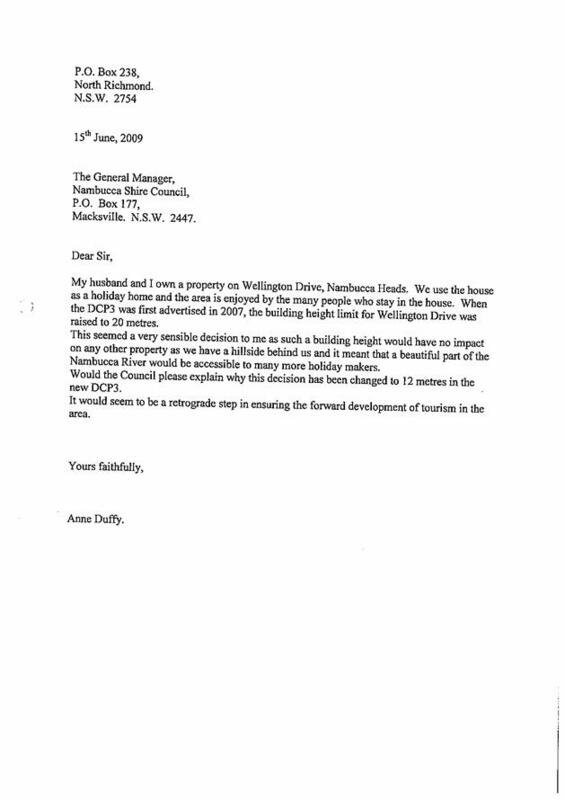 The owners of Lots 8 and 9 Wellington Drive have requested that the height limits not be reduced for this site. The existing restaurant part of this site is approximately 3.5m in height, the existing Residential Flat building is 3 storeys and is estimated to be around 10m in height. The subject site shown below is considered to be visually and environmentally sensitive. To allow for a well designed 3 storey development with a commercial ground level, a height of 10m is recommended in keeping with the existing residential flat building. This is a reduction of the existing height by 2m rather than 4m as proposed by the draft DCP. 5 5m height limit in Matthew Street should be preserved until such time that the place based study is complete. 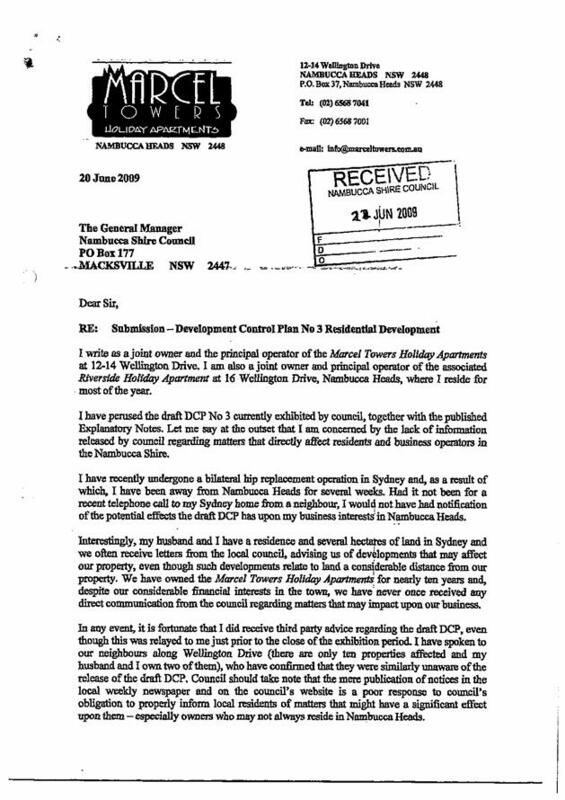 This matter was considered by Council on the 16 April 2009. Council resolved to display the majority of areas which are presently subject to a 5m height limit as 8.5m. 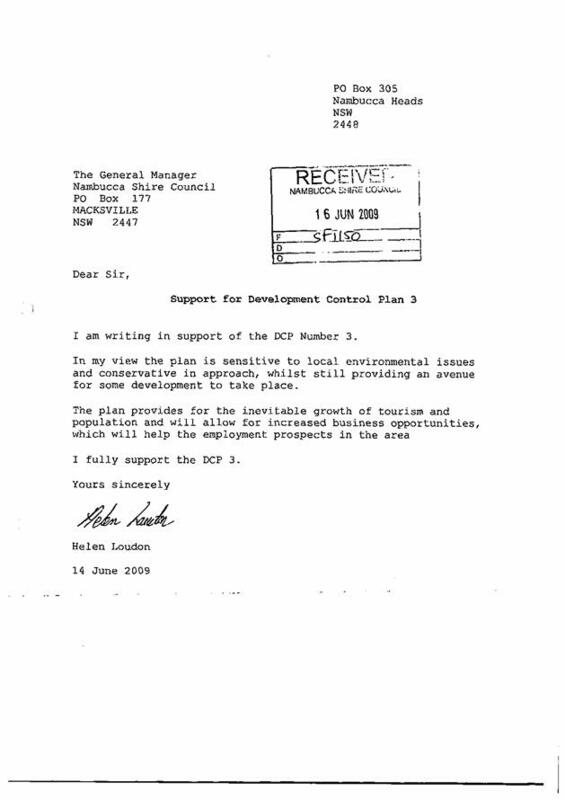 This is in accordance with the SEPP (Exempt and Complying Development Codes). A note was placed on the Matthew Street Precinct advising that a place based study was currently being prepared. · The number of storeys can be addressed at the Development application stage. It is considered that additional controls for the number of storeys can be used in place based studies where appropriate, but not in the general residential DCP. 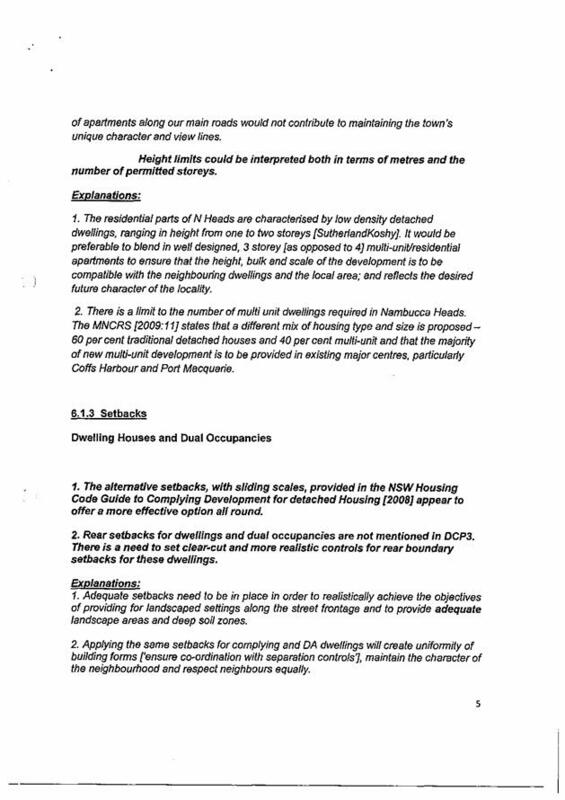 7 The dwelling type provisions incorrectly show 6-10 Fraser Street Nambucca Heads (Blue Dolphin Motel) as low density when it should be medium high density. The site in question is shown below. 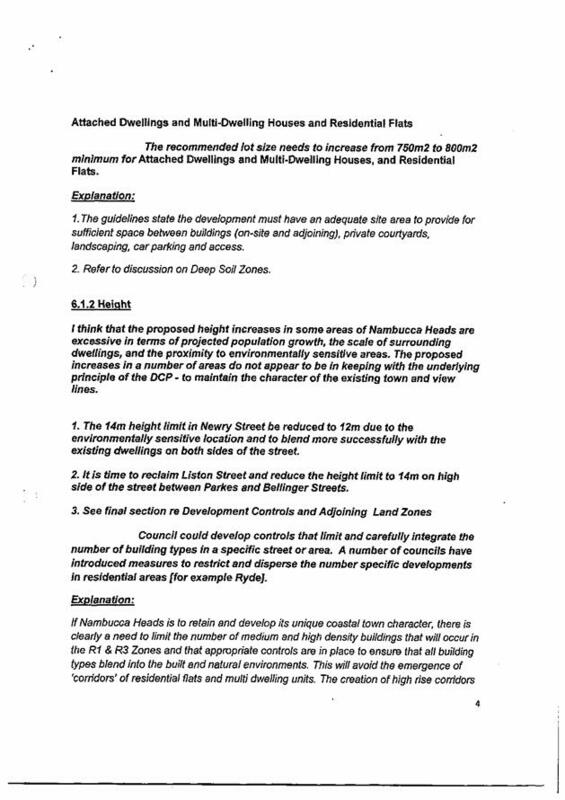 In responding to this matter it is important to note that the dwelling type provisions within the draft DCP are a guide to development that Council would like to see in an area and should not be confused with the Draft LEP 2009 zoning maps which specifically identify permissible land uses on a site. In the draft DCP this land is shown as “yellow” being suitable for dwelling houses, dual occupancies, attached dwelling or multi dwelling housing. This land currently contains the Blue Dolphin Motel and it is agreed that this land should be shown as “red” suitable for residential flats, attached houses, and multi dwelling housing. 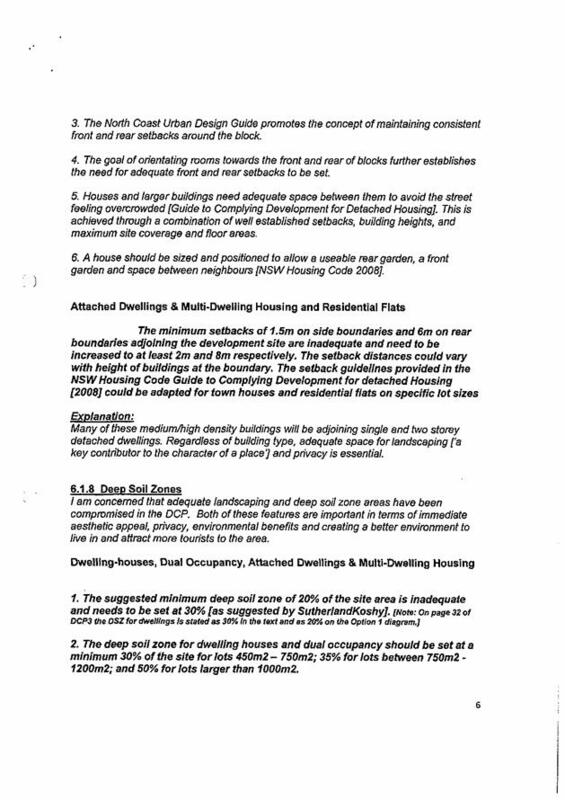 To avoid the preferred dwelling type maps being confused with LEP zoning maps, it is recommended that the “preferred dwelling types” maps be removed from the DCP. Should this section of the draft DCP be retained it is recommended that this site be amended to a preferred higher density dwelling type. 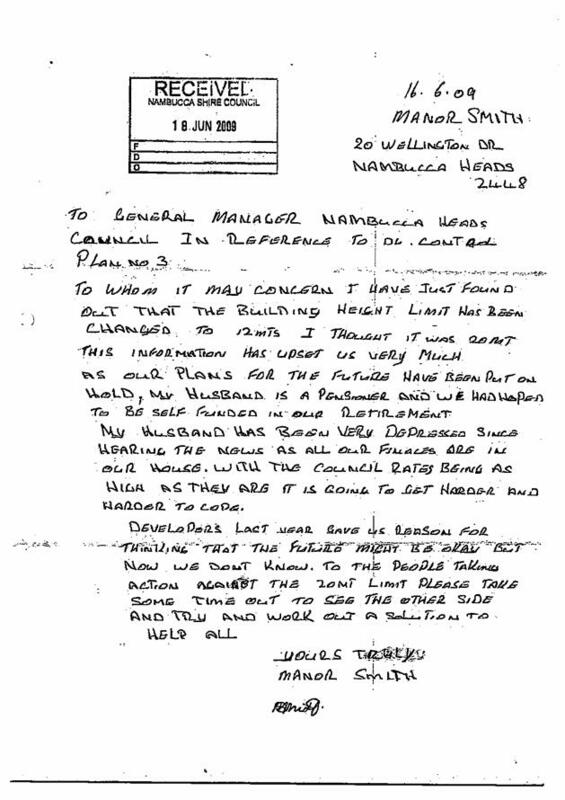 8 Lower Nambucca (what is happening)? 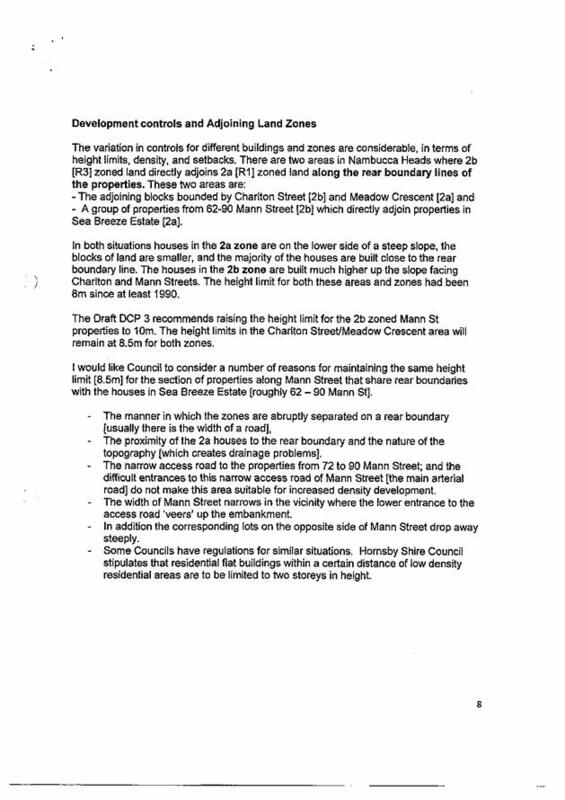 The Draft DCP recommends a height limit of 10m for the Lower Nambucca area over the existing 2(d) zone, which currently allows 8m. This is an increase of 2m. 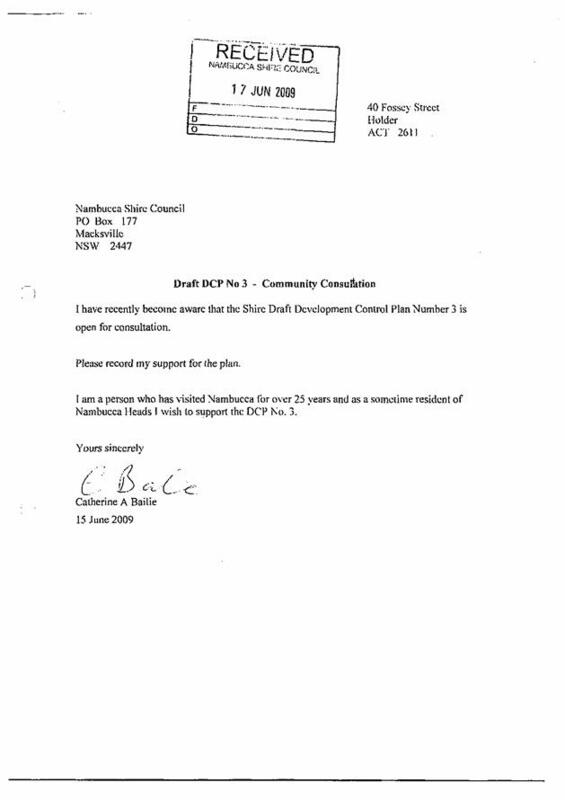 Other matters regarding the Lower Nambucca area are being addressed through the draft LEP 2009 and are not relevant to this DCP. 9 Minimum Lot Size for single dwellings of 450m2 should be increased to 500m2. The minimum lot size for single dwellings is based on the existing 450m2 lot size. Council has not encountered any issues with this lot size in the past and therefore it was not deemed necessary to amend this development standard. 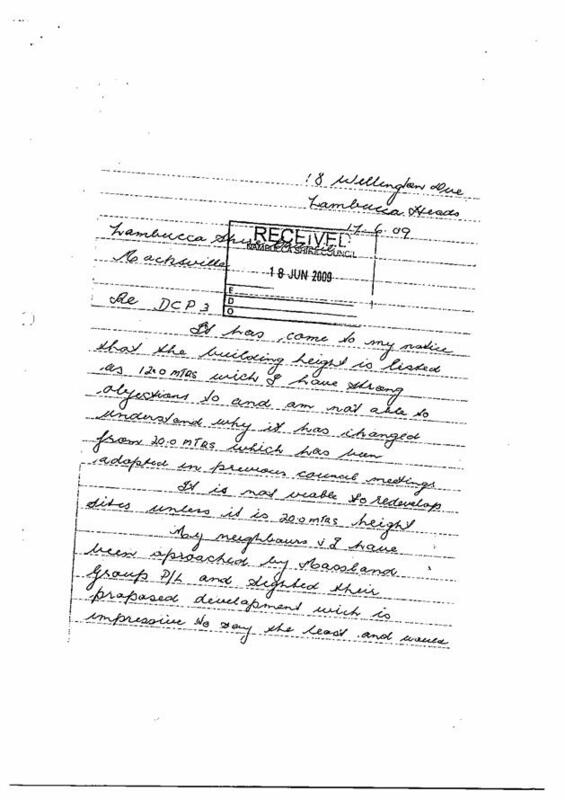 It was also maintained in the SutherlandKoshy DCP 3 Review. 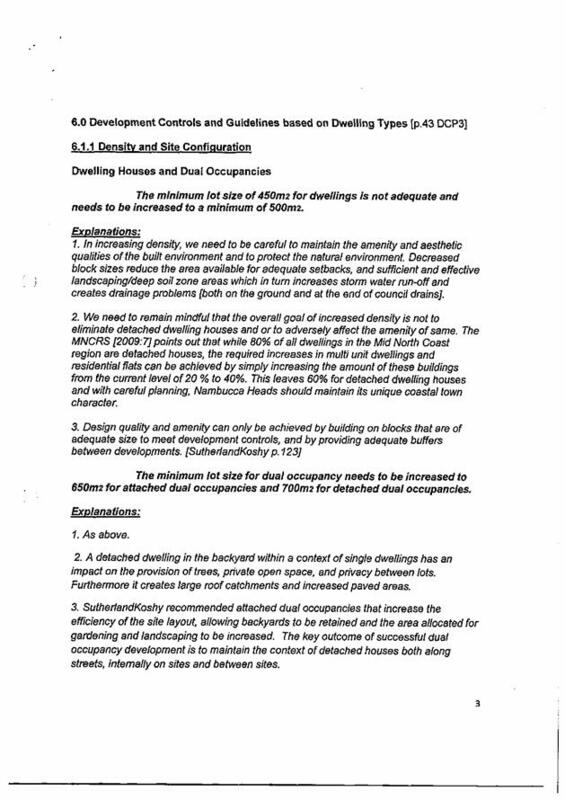 However, it was considered that lots less that 600m2 were inappropriate for Dual Occupancy developments. 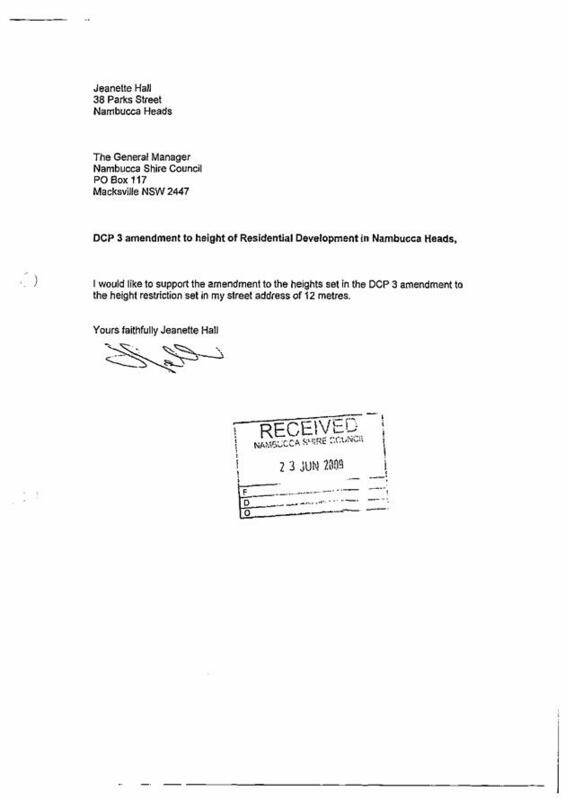 This amendment is reflected in the draft DCP (further comments relating to this development standard is provided below). 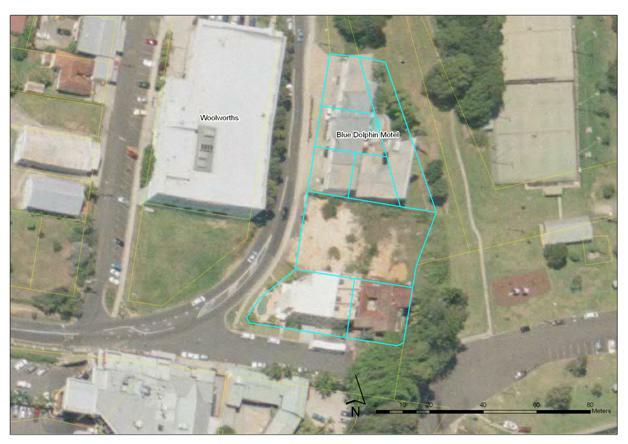 10 The minimum Lot size for Dual Occupancies should be 650m2 (attached) and 700m2 (detached). The draft DCP will allow development of attached or detached dual occupancies on lots 600m2 or greater with a minimum street frontage of 15m. 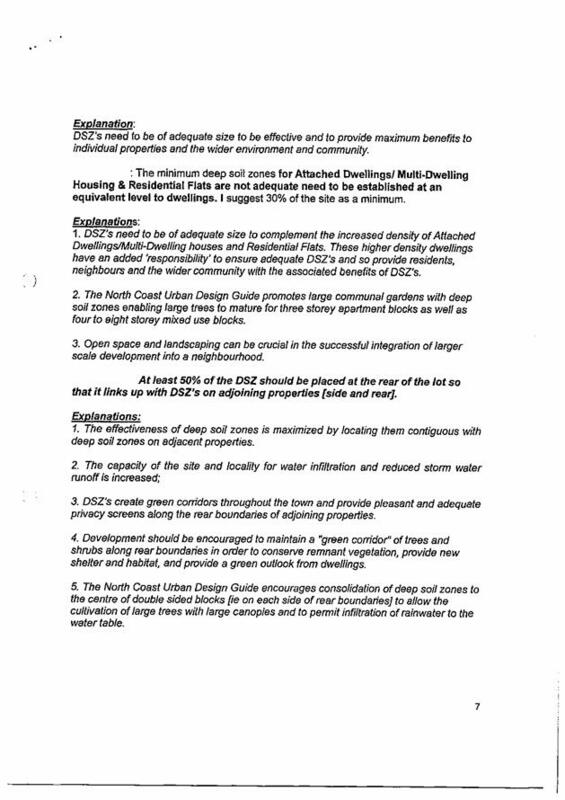 Dual occupancy development will not be permitted on battle axe allotments. The changes in the draft DCP are considered to be an improvement on the existing controls and therefore it is not considered necessary to amend the minimum lot size to 700m2. Council has not previously had a minimum lot size for multi dwelling housing. The draft DCP has a minimum lot size of 750m2, which will encourage consolidation of lots for larger scale developments. It is considered that other controls within the draft DCP will guide the type and scale of development that occur on an allotment, regardless of the lot size. The 750m2 proposed minimum lot size for multi dwelling housing is considered reasonable and will allow for smaller scale multi dwelling housing. 12 Council should adopt the SEPP (Exempt and Complying Development Codes) side setback requirements for single dwellings and dual occupancies. It may not have been clear in the draft DCP but it has generally incorporated the SEPP provisions for side boundary setbacks. It is further recommended that setbacks for dwelling houses and Dual Occupancies be amended to more accurately reflect the provision of the SEPP (Exempt and Comply Development Codes). 13 Rear setbacks for dwellings and dual occupancies should be included and they should reflect those provided by the SEPP (Exempt and Complying Development Codes). In responding to this comment it important to note that the SEPP (Exempt and Complying Codes) provides controls for deemed to comply developments. Typically, complying development controls are more stringent that what Council may accept through a normal development application process where further detailed assessment may be required. Rear setback controls for single dwellings are not considered to be required, nor were they recommended by the SutherlandKoshy DCP 3 Review. Controls for deep soil zones will provide for a reasonable area of undeveloped land at the rear of the property. Nevertheless, there is an opportunity for this matter to be given site specific consideration at the development application stage. As such, it is not deemed necessary to include rear setbacks for dwelling houses and dual occupancies. 14 The side and rear setbacks for attached dwellings, multi dwelling housing and residential flats are inadequate, they should be increased to 2m and 8m respectively or the setback boundary could vary with the height of the building. Adapt the SEPP (exempt and complying codes) setback guidelines for these dwelling types. At present the minimum side setback for multi dwelling housing is based on the old AMCORD guidelines. The draft DCP is more in keeping with the Residential Flat Design Code, which is a more contemporary guideline for multi dwelling housing developments. 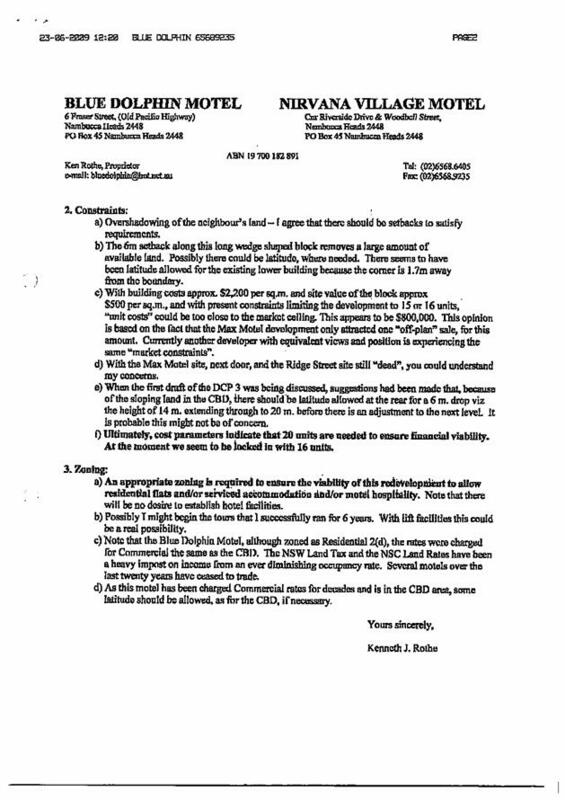 The SutherlandKoshy DCP Review recommended a 1m setback on one boundary and 3m on the other. There was no recommendation for a rear setback. The draft DCP has recommended a minimum side setback of 1.5m and a rear setback of 6m. It is noted that development must also comply with the separation controls which can provide for setbacks up to 8m, depending on the adjacent activities. A combination of these controls encourages unit orientation which address the front and rear, providing good surveillance of the street, whilst minimising conflicts with adjoining residences. Side and rear setbacks for multi dwelling housing in the draft DCP have been developed in consideration of the Residential Flat Design Code as well as the building separation and deep soil zone controls. It is therefore not considered necessary to amend these provisions. It is not recommended that the Housing Codes controls developed for dwelling houses be used as multi dwelling housing controls. 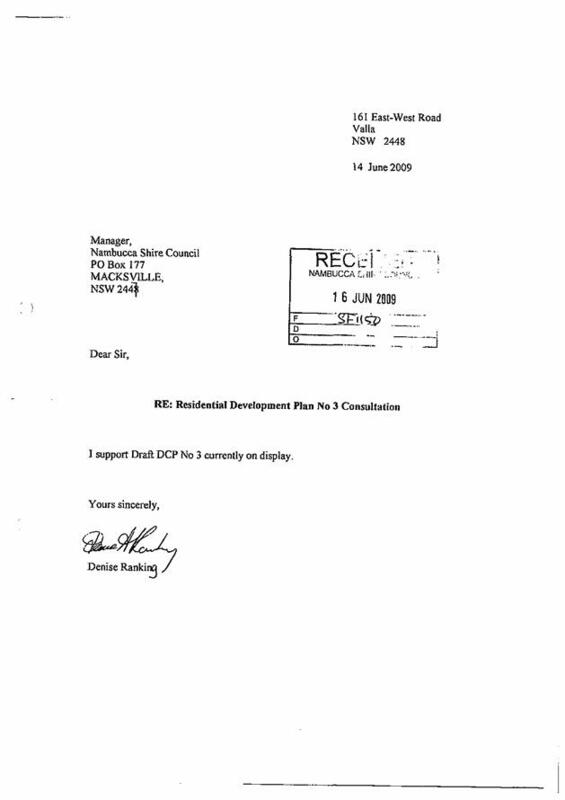 Should the Department of Planning prepare standards for multi dwelling housing in the future, then the DCP may need to be amended at that time. 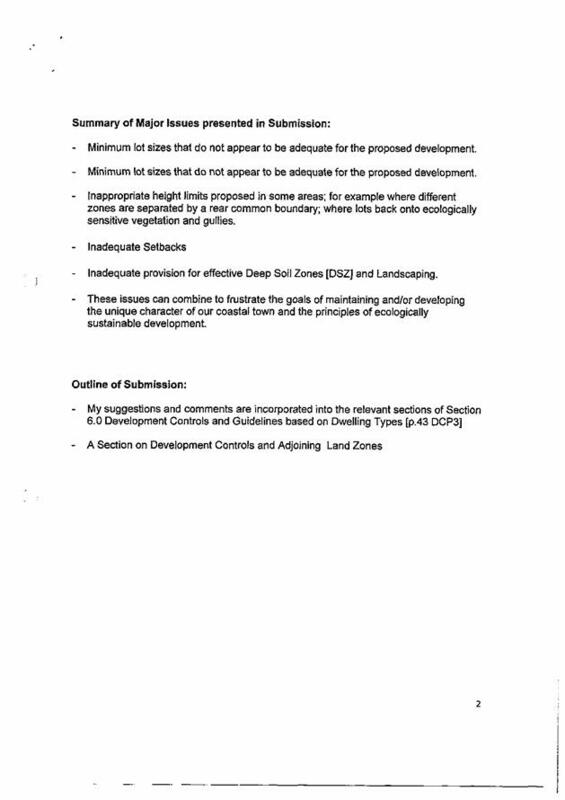 15 Deep soils zones for single dwelling houses, dual occupancies, attached dwellings and multi dwelling-housing should be 30% or on a sliding scale similar to the housing code provisions. The deep soil zone for dwelling houses, dual occupancies, attached dwellings and multi dwelling housing was incorrectly displayed as 20% in places within the draft DCP. It should read 30% to be consistent with other parts of the document. The DCP has been amended to reflect this anomaly. 16 Deep soil zones for residential flats should be at a minimum 30% of the site area. The SutherlandKoshy DCP 3 Review recommended 20% deep soil zones for residential flat developments. The draft DCP recommends a 25% deep soil zone which is consistent with the minimum requirements recommended in the NSW Residential Flat Design Code. It is not considered necessary to increase the deep soil zone for residential flats to 30%. 17 At least 50% of the deep soil zone should be placed at the rear of the lots so that it links up with DSZ on adjoining properties. Each dwelling type requires two (2) deep soil zones, one at the front and one at the rear. 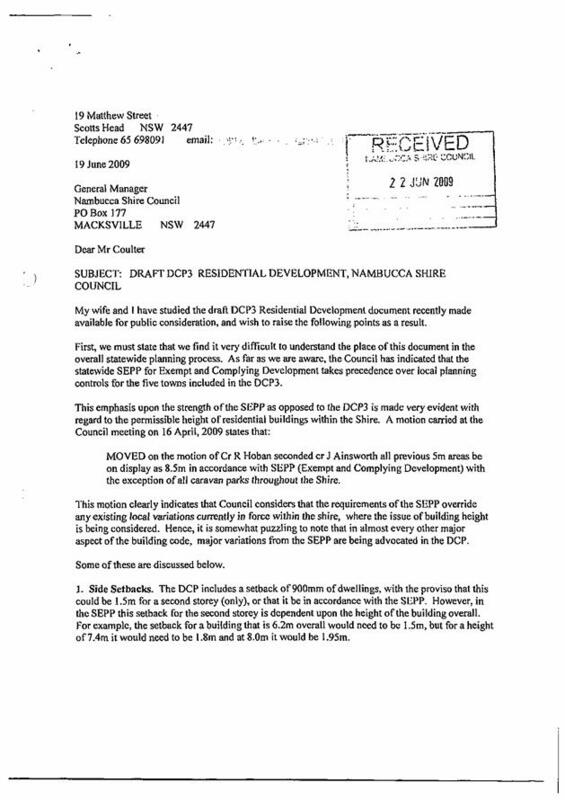 To allow for site specific designs at the DA stage, the draft DCP does not specify the amount of deep soil zone required at the rear of the site (except for residential flats). Deep soil zones on the front of allotments may also be contiguous with neighbouring properties. 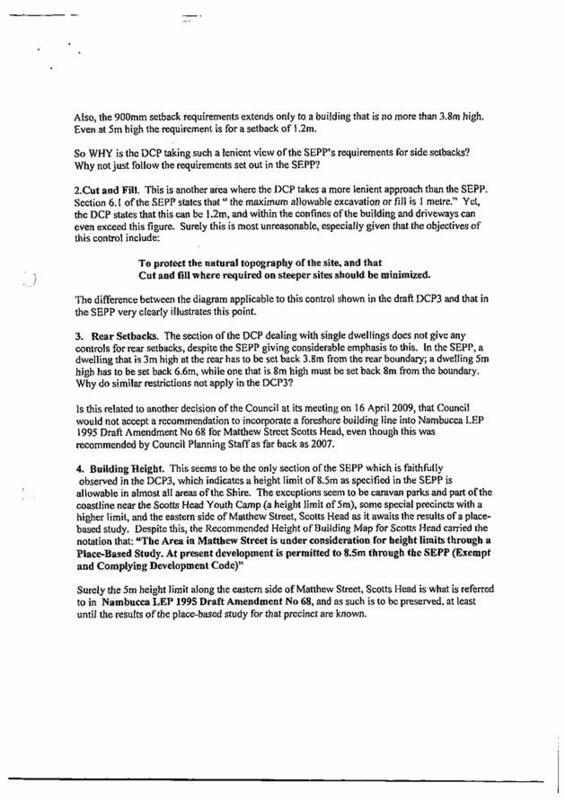 18 Council should adopt the provisions of the SEPP for cut and fill. In responding to this comment its important to note that the SEPP (Exempt and Complying Codes) provides controls for deemed to comply developments. Typically, complying development controls are more stringent that what Council may accept through a normal development application process, where a more detailed assessment may be required. To minimise all development to a 1m max cut and fill, would make development on some sloping lots difficult. It would also eliminate subsurface parking on larger developments. The Draft DCP requirements for cut and fill have been designed to allow development with cut and fill requirements to occur to a reasonable extent, subject to engineering requirements, whilst minimising cut and fill in areas that are not within the building envelope. It is not recommended that the SEPP (Exempt and Complying Development Codes) requirements for cut and fill be used in the Residential DCP. · considers the existing and future desired character of a locality and its environment. The draft DCP is unlikely to have any detrimental economic impacts on Council or the community. Amendments to height limits through the DCP 3 will provided for and encourage appropriate re-development within the urban areas. 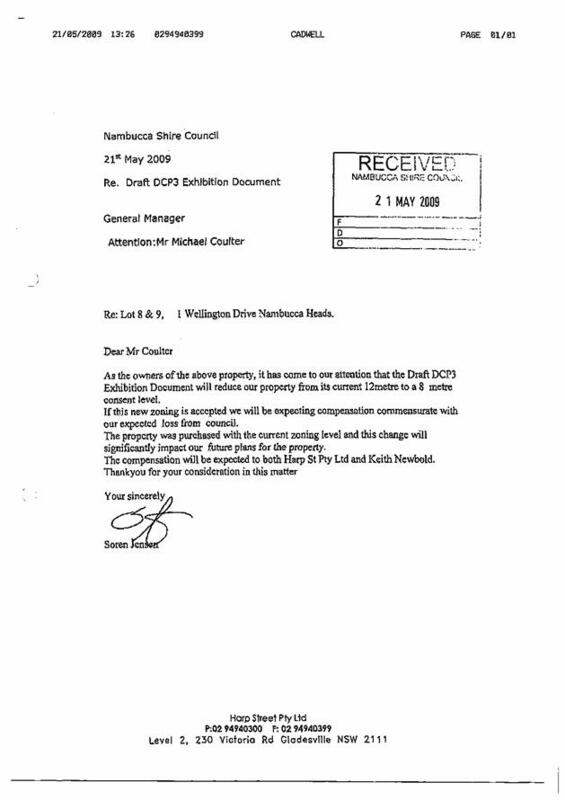 It is noted here that DCP 3 will need to be incorporated into a shire wide DCP prior to the gazettal of the comprehensive LEP. This will allow a short trial period of the DCP 3 which can be amended appropriately at this time, reducing the risk of any anomalies in the document. The Nambucca Valley Community Services Council Inc has been looking for suitable land to re-establish the Men’s Shed. They are currently in unsuitable premises in Nambucca Heads. An unused road reserve has been identified as a possible site off River Street, Macksville and the Macksville Showground. The Nambucca Valley Community Services Council Inc has for a number of months been seeking a site to re-establish the Men’s Shed and a Community Kitchen. Finding suitable vacant land with services is very difficult but eventually a site at the Showground and an unused road reserve near the Rural Fire Service facility were further considered. 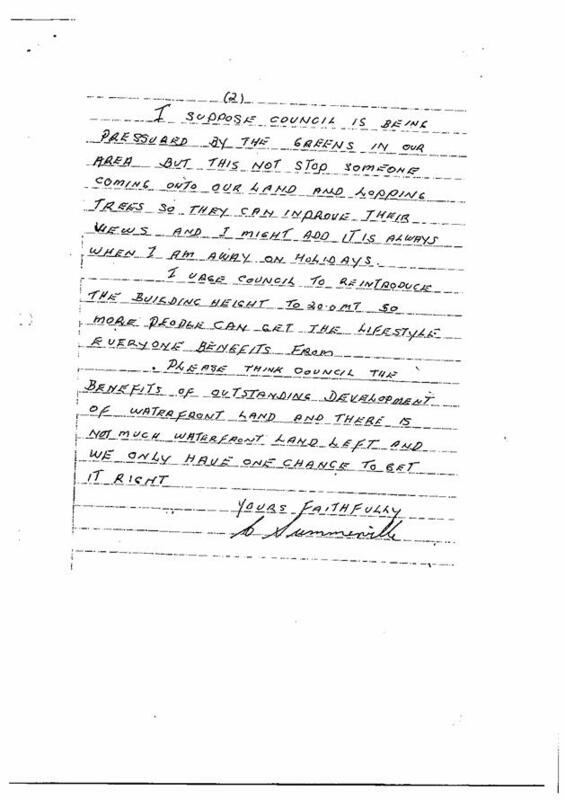 The cost of providing sewerage was high and the group reconsidered its needs. Council now has a formal request for the provision of land being the road reserve off Gumma Road as shown on the attached sketch. The proposal is only for the Men’s Shed and not the Community Kitchen as a septic tank can cater for this use. 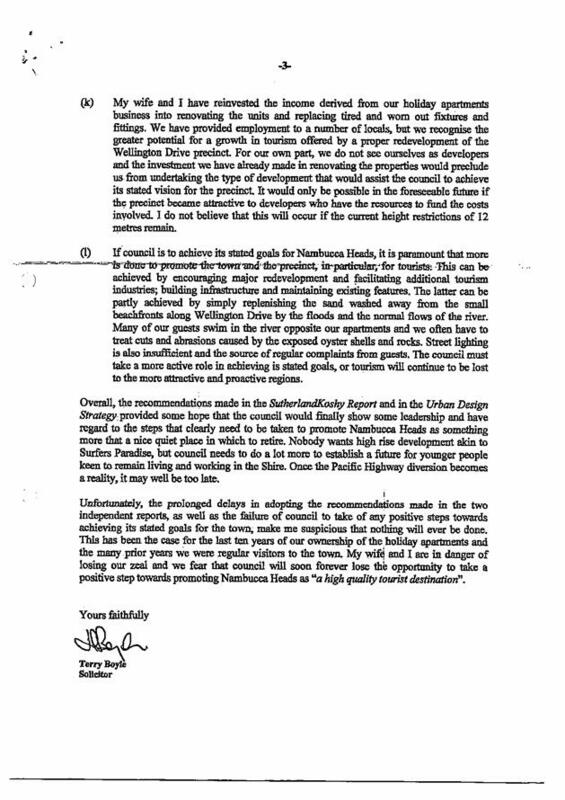 Already this proposal has created an objection from one of the neighbours who state that they are leasing the road and also wishes to acquire the land. Further, the soil characteristics in that area are not suitable for septic tanks. The success at this site is low. 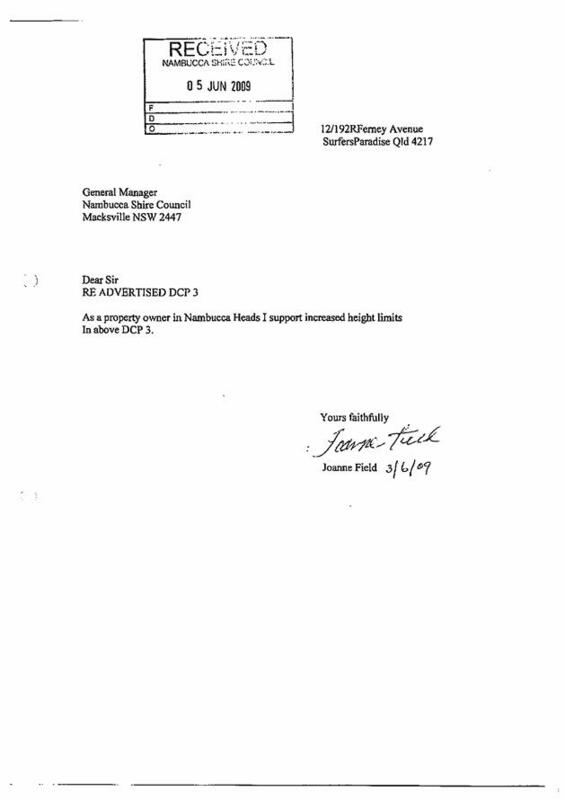 I understand that the Men’s Shed have put in an expression of interest for land off the Link Road, Nambucca Heads in response to Council’s advertising. The other option is at the Showground. The views of the Committee of Management has been sought and should be available for the meeting. 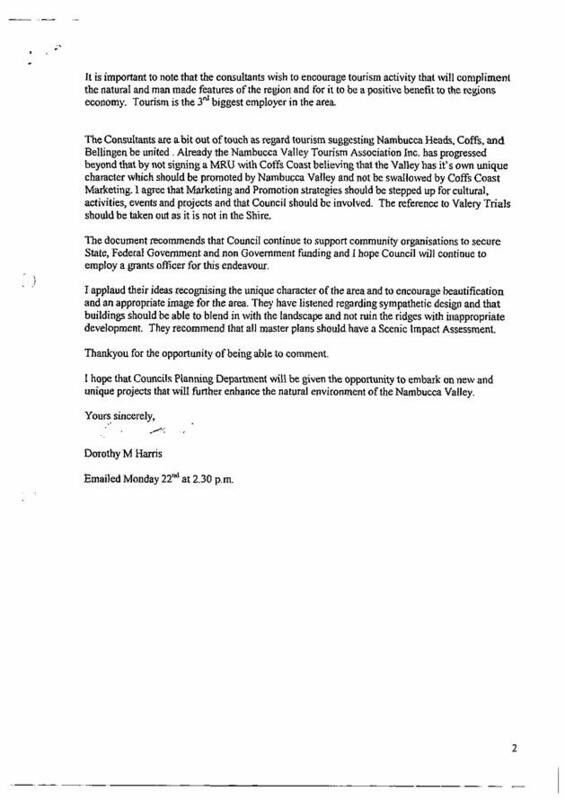 Nambucca Valley Community Services Council Inc.
Nil at this stage. Minor clearing may be required. The Men’s Shed is all about providing a social outlet and community assistance. Nambucca Valley Community Services Council has access to funding to ensure the viability of the project. The lack of a suitable site will see the Men’s Shed remain in rented premises that is not entirely suited to the needs of the organisation. Council would require the applicant to meet all costs. Nambucca Valley Community Services Council Inc has funding. The Bellwood Traffic Contributions Plan includes as one of the projects the completion of the link between Alexandra Drive and Marshall Way. 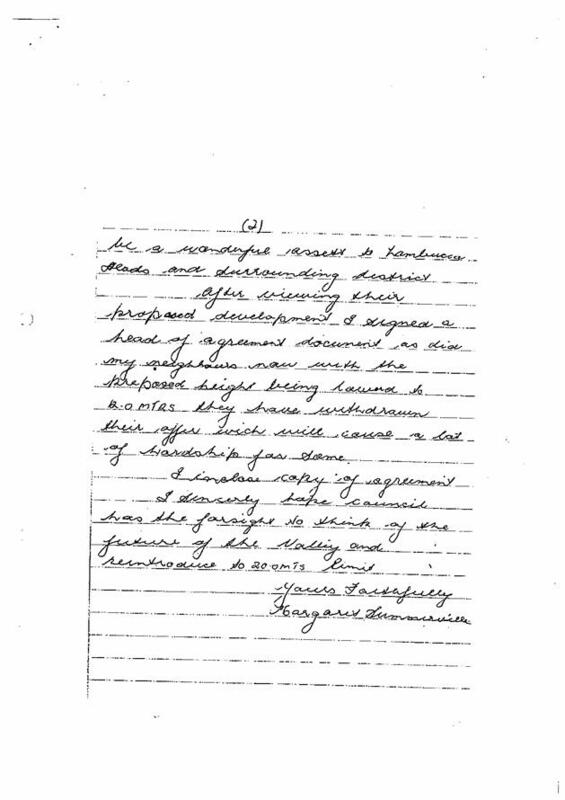 This item has generated a large number of form letters of objections to that one aspect of the Plan. 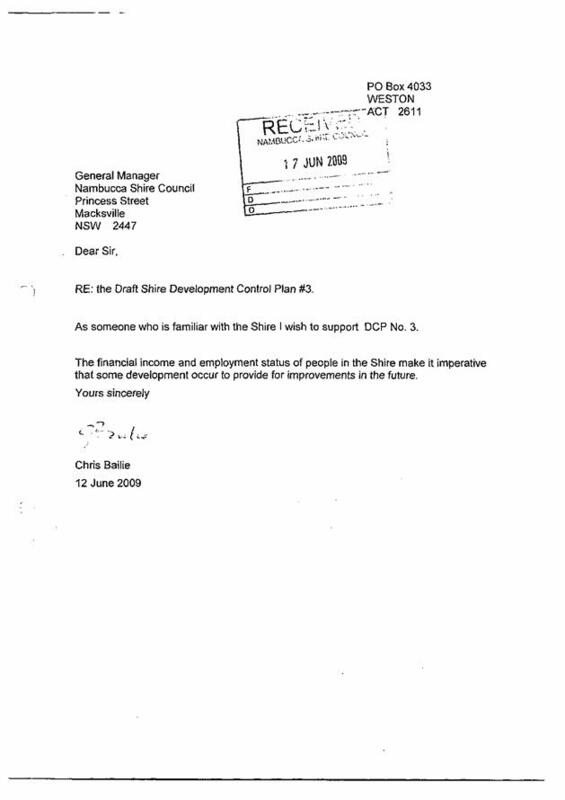 The link is part of the Contribution Plan which will come before Council in August 2009. The opportunity has been taken to allow residents to speak to Council on-site to hear their views which will then be considered with the overall Contribution Plan next month. 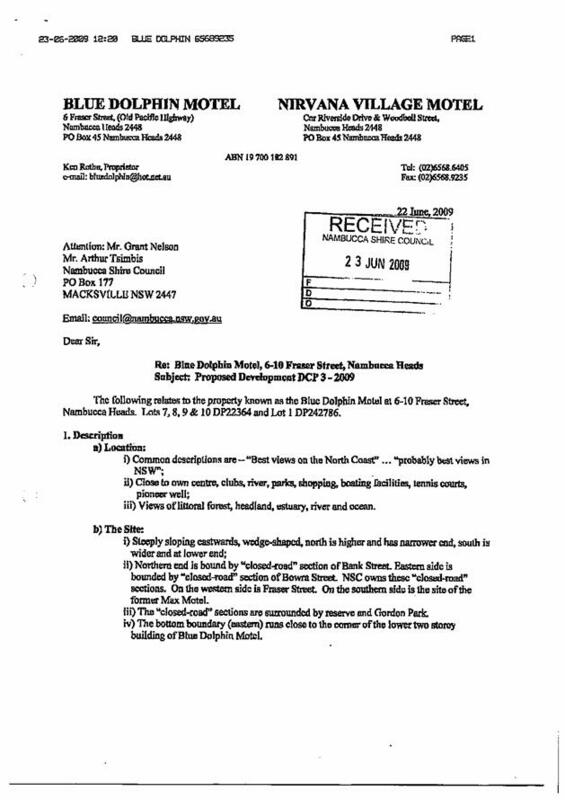 Notwithstanding the residents views, the construction of the link section of road represents sound traffic and planning management. 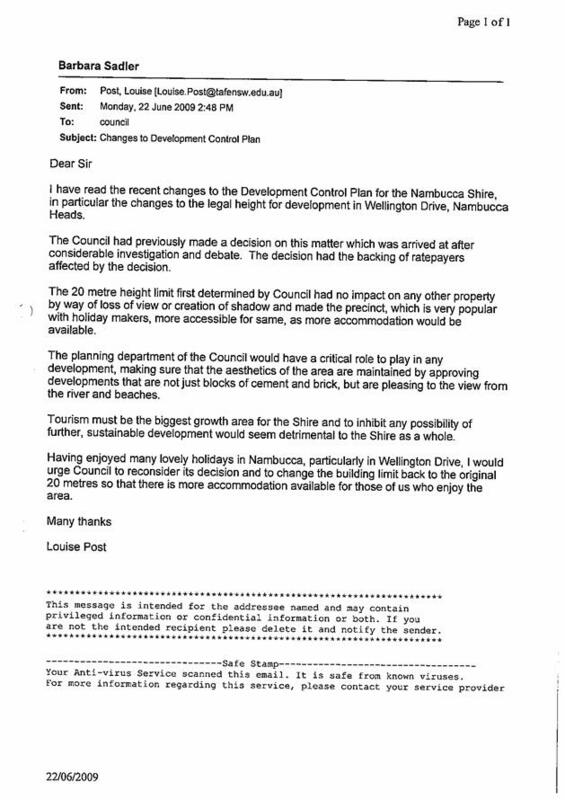 That Council retain the inclusion of a link road between Alexandra Drive and Marshall Way, Nambucca Heads in the Bellwood Traffic Contribution Plan on the basis that it is required for future traffic management and planned development of that precinct. 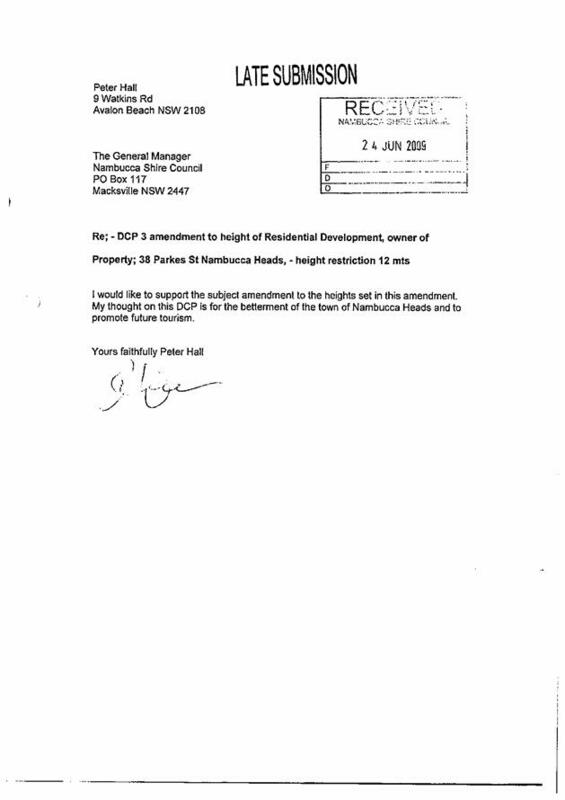 · Delete from Contribution Plan but include as a condition of consent on any major residential development in Alexandra Drive. 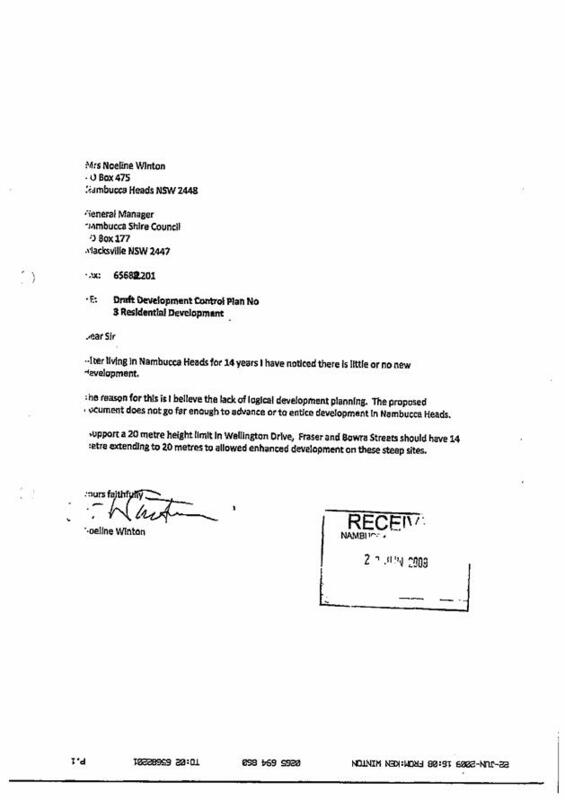 Note that the Department of Planning will determine the Development Application not Council. 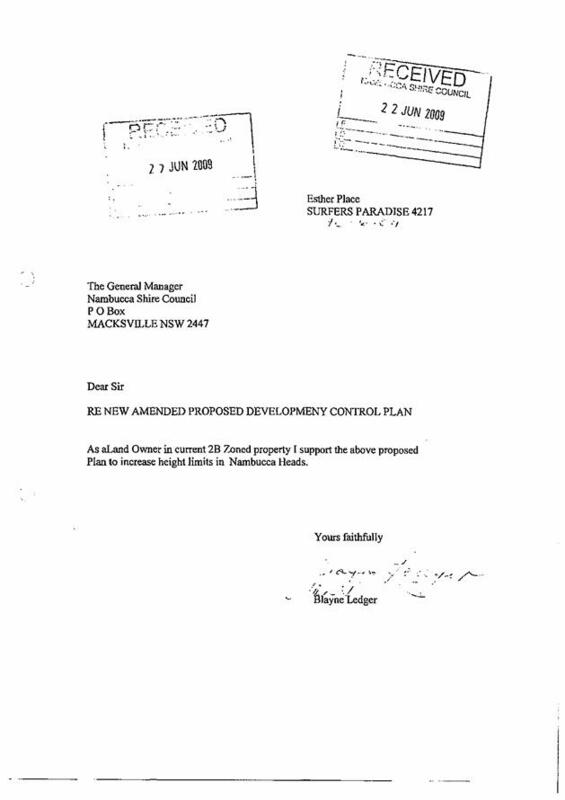 · Defer indefinitely with a future Council to consider the link when development demands are greater. The longer the delay the greater numbers of people impacted. The removal of the link from the Plan means that Council will have to meet the full cost at that time. The Bellwood Local Roads and Traffic Infrastructure Developer Contribution Plan 2009 includes six projects that improve the capacity of the local road network to cope with the increased traffic. That traffic will be generated by extra residential housing at the end of Alexandra Drive, New Aged Care Housing in Marshall Way and the proposed Commercial Development in Mumbler Street and Bellwood Road. 6 Roundabout Construction – Bellwood Road and Marshall Way. 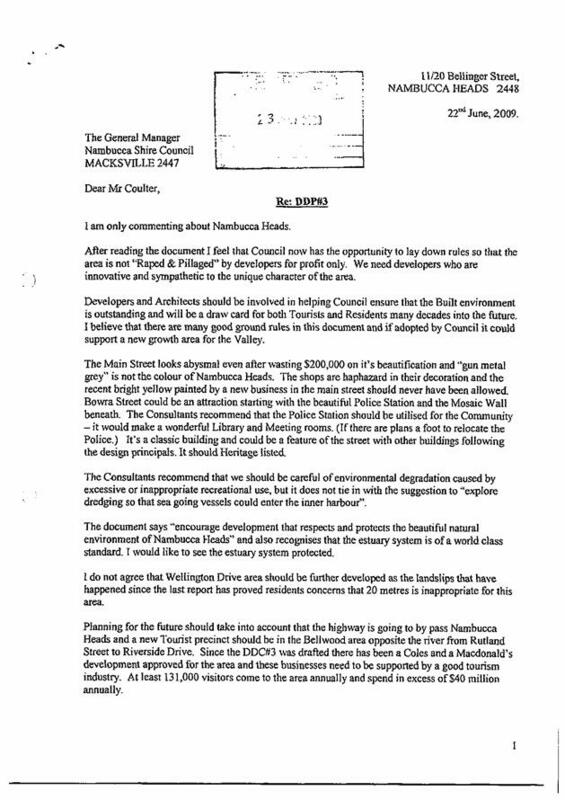 Council has received petitions and form letters against the proposal inclusion in the Bellwood Local Roads and Traffic Infrastructure Developer Contribution Plan 2009 to link Marshall Way and Alexandra Drive. 3 Residents Impact on lifestyle and safety. · Environmental impact of the link road. Council has been given traffic growth figures relating to the new supermarket and McDonalds. These figures and the assumption that 30 new residential lots per year will come on the market over 20 years allows the growth in vehicles to be forecast for the busiest section at Bellwood Road (Highway end) over time. One way to consider the impact is to compare the projected traffic counts to those that already exist in the urban areas. The latest urban traffic counts date back to 1997 so increases on those numbers could be expected. If the residential and commercial development occurs as forecast then in 20 years Marshall Way will have similar traffic flows to Mann Street and Riverside Drive in Nambucca Heads. 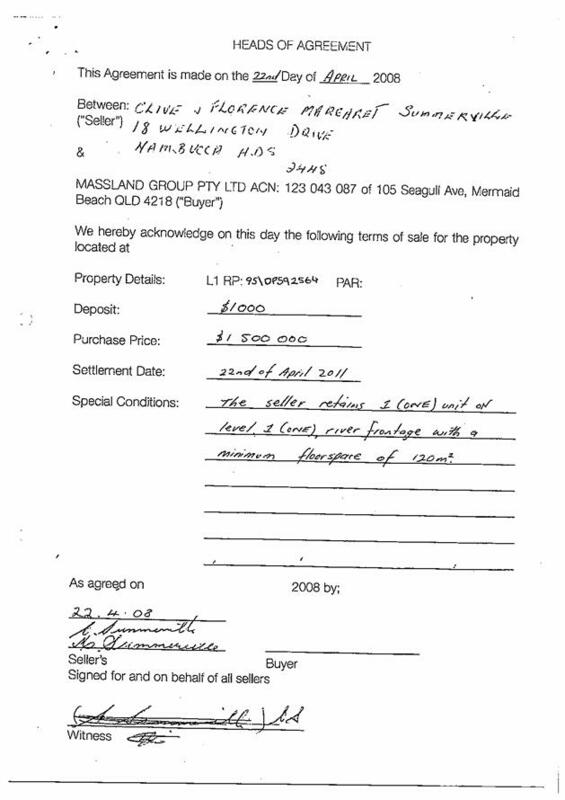 The site is shown on plans as Lot 1 DP 1067515, a Lot reserved as a Nambucca Aboriginal Area. Lot 1 has an area of 4041m2 . Plan DP 828979 shows a further Lot created around the site as a buffer. This Lot has an area of 17,040m2. The intention was that the sacred site would be secured from view from development elsewhere in the area with this buffer. Extra tree planting could be carried out in the buffer if necessary. The Contributions Plan is base on generating income for the six projects as mentioned earlier. The total income will be generated 30% from residential and 70% from commercial development. The residential component comprises 363 on the north side (Alexandra Drive) and 187 on the south side (Marshall Way). Removing the link road removes 363 contributions making the Plan no longer financially viable. That means that all the proposed traffic arrangements such as roundabouts and extra lanes will be put on hold due to lack of funding. Public exhibition of documents and resulting comment. The “link” road will be at the end of a wetland area. Design features and construction can be in a manner that is sensitive to the location. A detailed assessment is warranted. The “link” generates both positive and negative impacts. Local residents are concerned about the impact of higher traffic numbers on their safety and amenity. On a larger scale the access is needed to improve the travel route to the commercial area, to allow through road for school bus and traffic generally to remove one way in access to Alexandra Drive and Marshall Way, to link growing local communities, to upgrade the roads for increases in traffic numbers relating to new housing and other developments (eg Aged Care and Education are possible) and to reduce the need to use the Pacific Highway. This distance from the southern end to the Plaza via the proposed link is 1.3 km compared to 5.5 km via the Pacific Highway. (See Map). The development and re-development of land on the western side of the Pacific Highway is likely to continue due to its close proximity to the urban areas of Nambucca Heads. A circular through route is essential to that growth in population and housing for access to commercial areas and as a transport route for school buses and waste collection for example. The residents believe that the value of their properties will reduce with greater traffic flows. Not resolving this matter now will result in even greater difficulties in the future as more people will be impacted. Council will also be faced with meeting the full cost at a future time. 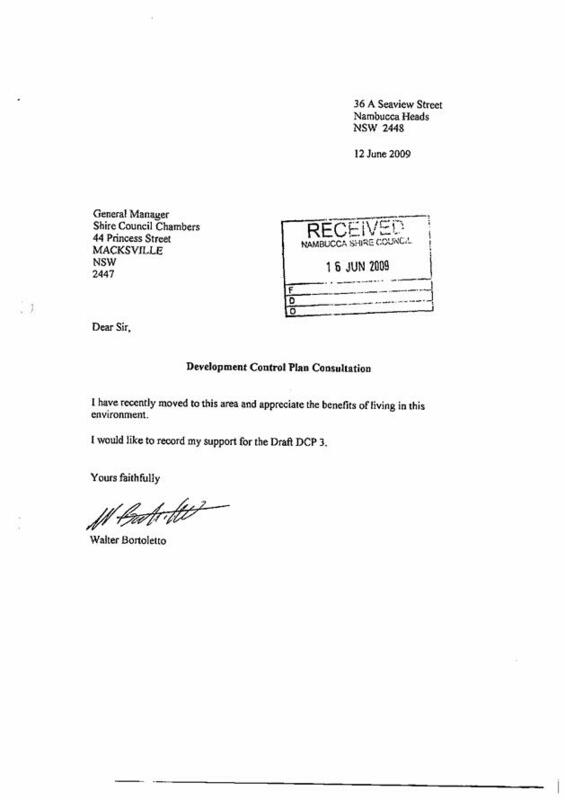 Some 15 years ago Council decided not to allow the link to be created. At that time there was standard urban housing in Marshall Way and Rural Residential in Alexandra Drive. Now there is urban housing on both roads. Removing the link road will exclude 363 residential blocks from the northern side making the plan not-financially viable. The income will not be sufficient to undertake the other traffic management projects. The construction of the link road is part of the Draft Contribution Plan. This would generate funding on a per Lot basis for 100% of the cost eventually. Maintenance costs over time only increase for a 180 metre extra length of urban road. Developer funds through the Contribution Plan will meet 100% of the costs. Council comment is required on the due process and the area of agreement and disagreement prior to the meeting of the Project Facilitation Team (PFT). A workshop session will be conducted with this report. e) a high degree of acceptance by the community. 2 That the results of the Workshop be conveyed to the Project Facilitation Team. 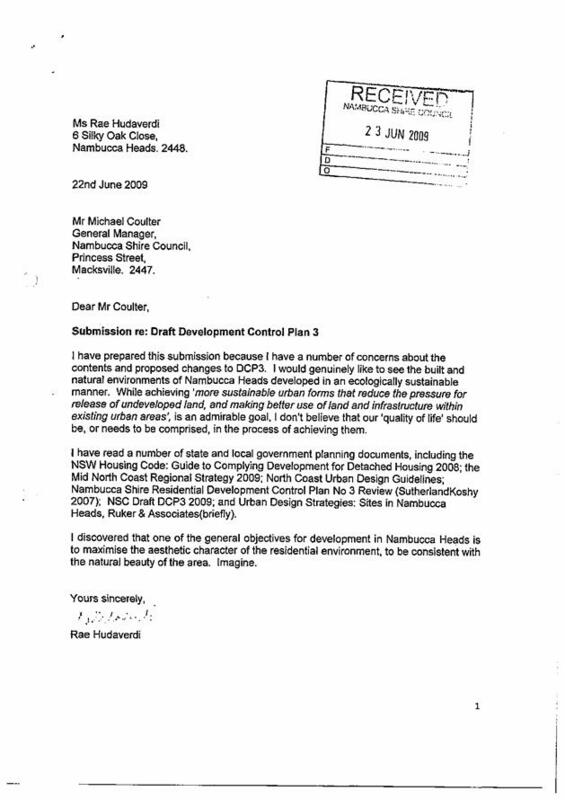 The next step in the consideration of Scotts Head Draft Masterplan is a meeting of the PFT at Taree (11.00 am Friday 7 August 2009) to work through the issues. Council’s PFT representatives are the Mayor and Director Engineering Services. This workshop will be used to provide guidance to the representatives prior to the meeting. A flow chart has been provided that looks at the questions each organisation needs to address to move forward. This will be worked through at the meeting. In addition, the list of issues that were raised by those making submissions is attached. The public consultation was conducted by the Department of Lands. 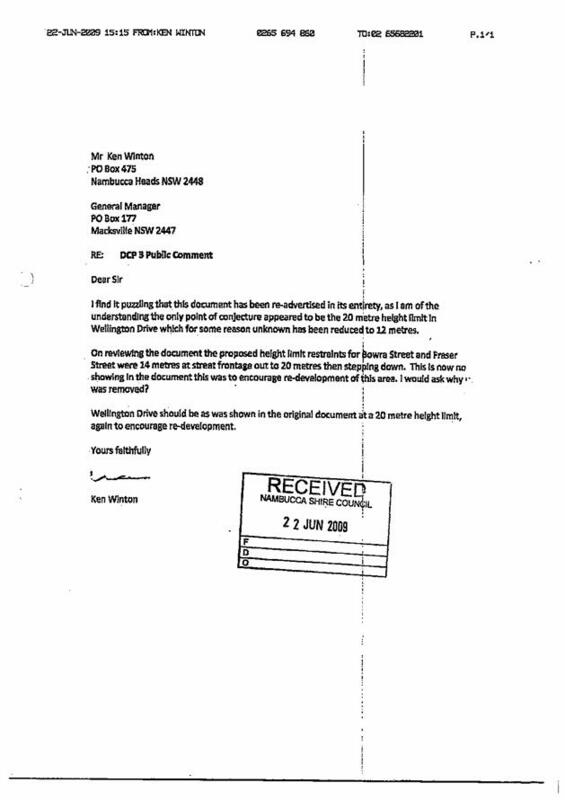 The Department has provided a copy of all submissions received and these were circularised for GPC meeting 17 June 2009. 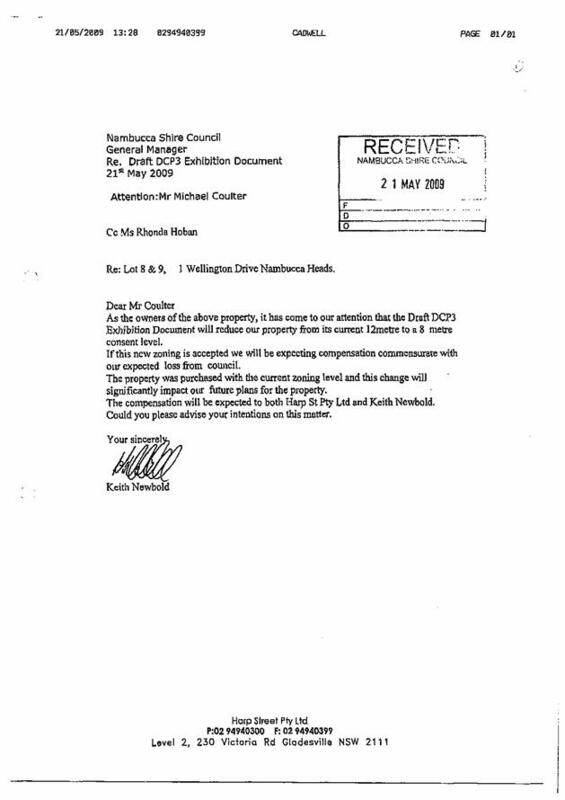 Council sought further information relating to previous land ownership. 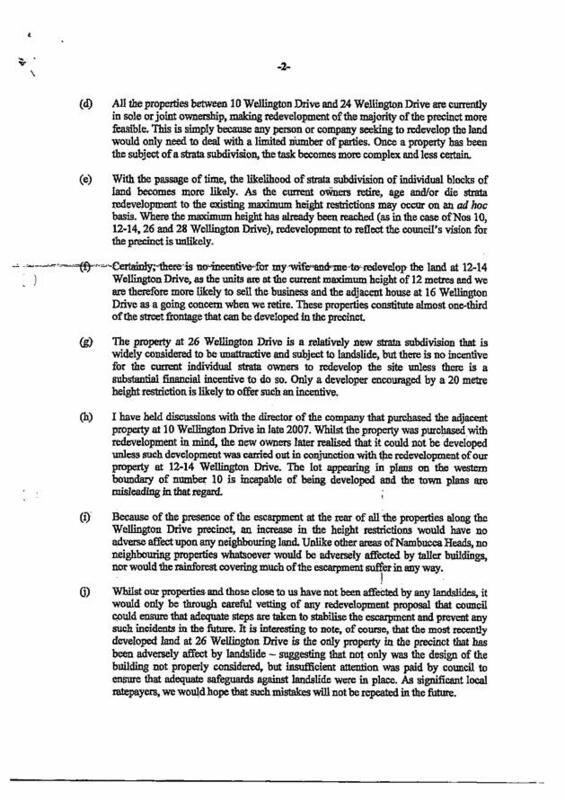 Seven steps of changing ownership and subdivisions have been identified and a summary as Appendix 1 with plans is attached. The land is correctly identified as Crown Land, Public Reserve and Private and has no impact on the decision making. One other matter affecting the land is the existence of Park Street. This has been formally closed. Plans dated 1974 show the closed road. Ocean Street and Short Street did not formally join. The road would have partly been across Crown Land. A public road was created to rectify this in 1982 (DP 43118). 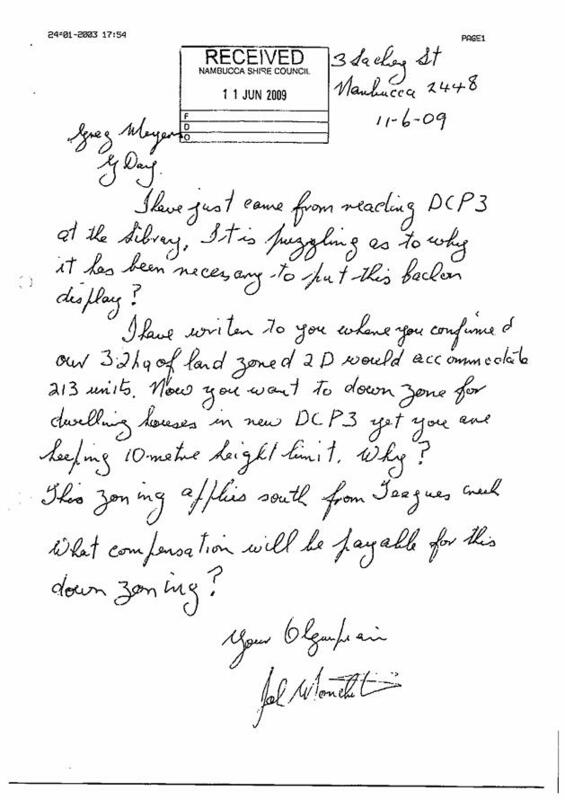 See Appendix 2.
called Lots 11 and 12. The end result is that the land occupied by the Bowing Club, Caravan Park and Adin Street Oval is also the land owned by each Authority.